​School will re-open Tuesday morning at 8.50a.m. 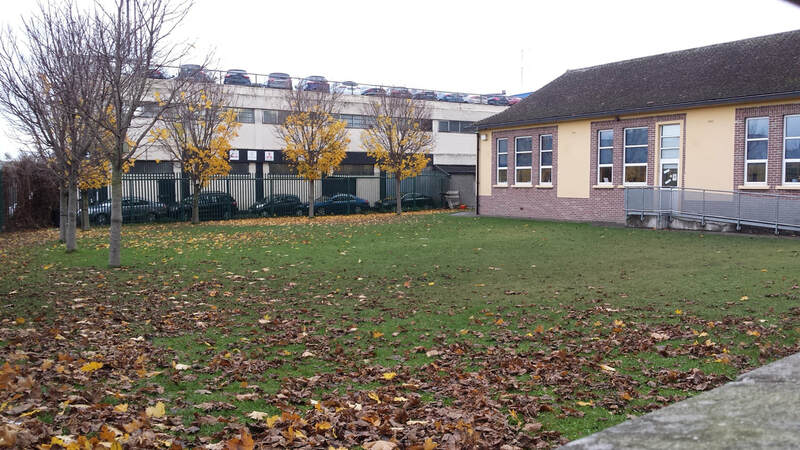 The Department of Education & Skills have issued funding for a new school extension. 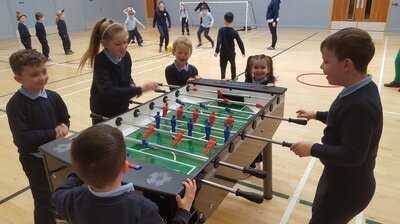 We are delighted with the news as it will mean that the children will have more spacious classrooms and we'll be able to grow our school community. We're hoping that building work will commence before the end of 2019. 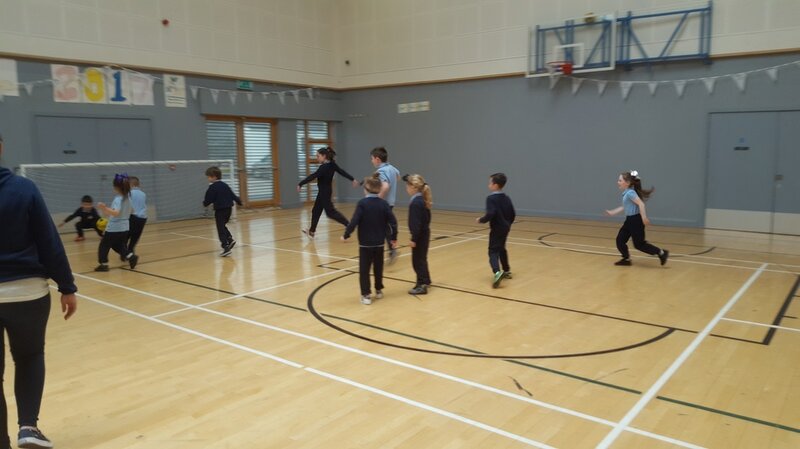 Tennis with Arek is back on Wednesdays - Wear tracksuits! Thanks to Mick (Brooke's granddad) for all his help with our new sign. Also a big thanks to Vanessa our designer for all her work. It looks very smart. 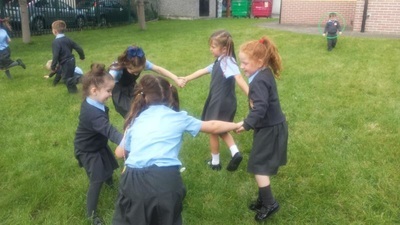 We had a busy June and today heralds the beginning of the summer holidays. 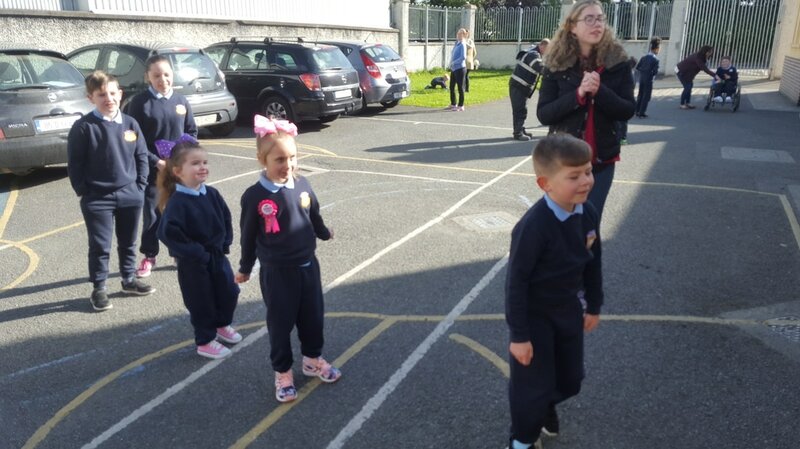 We'd like to wish Emma, Justin, Caoimhe and Michael all the very best as they finish with us and begin a new adventure in secondary school. We know you will blossom. 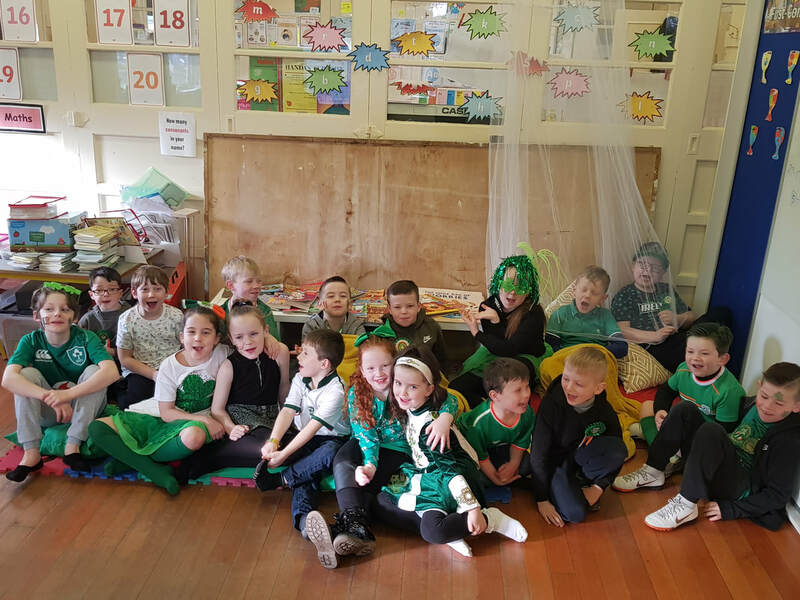 A huge thank you to the St. Cillian's school community & Parents Association for all the support and fundraising throughout this school year. 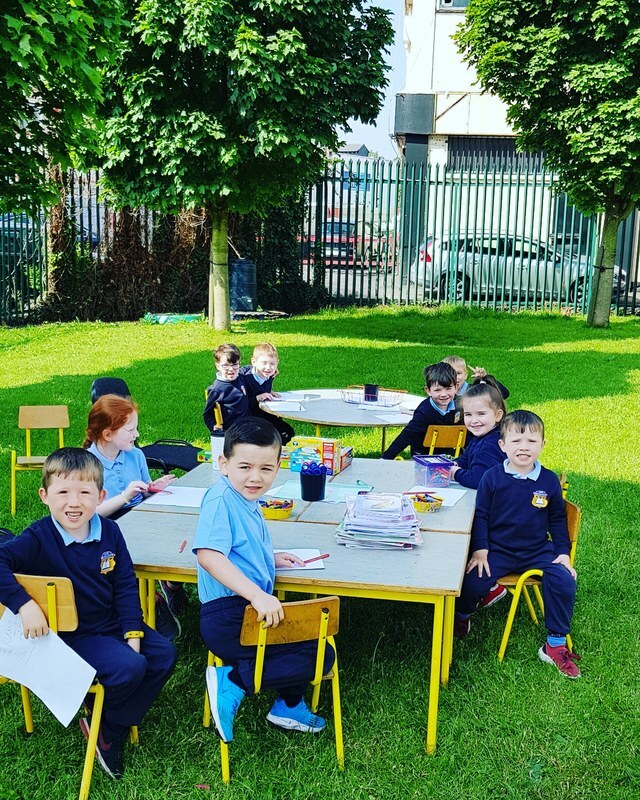 ​Finally, we'd like to wish everyone a sunny and safe summer and we'll see you all on the 30th August for the new school year. 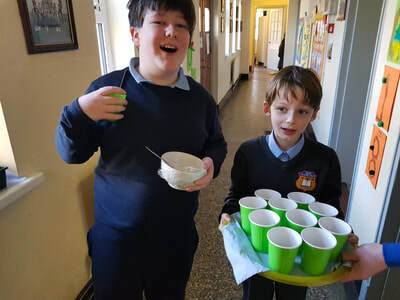 School Lunches are not available from Monday 25th June to Thursday 28th June. 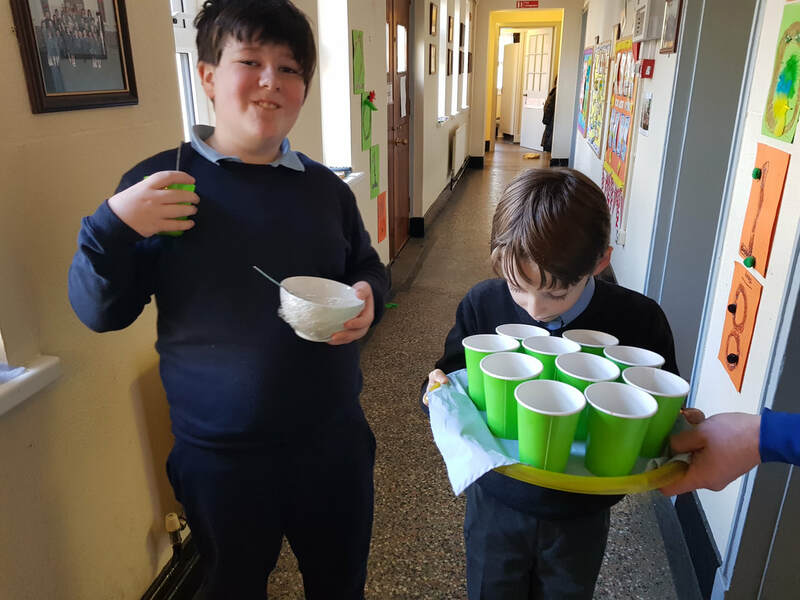 Children are asked to bring a healthy packed lunch with water. No other drinks are permitted. Please be mindful of a nut & egg allergy we have in our school. 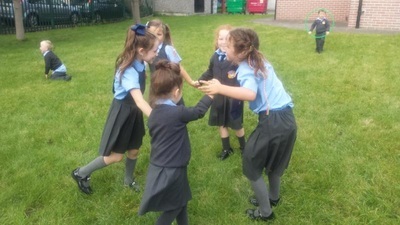 School will close Thursday 28th June at 12pm for the summer holidays. Our Senior Room had a successful day at South Dublin County Council Cross Country Final. 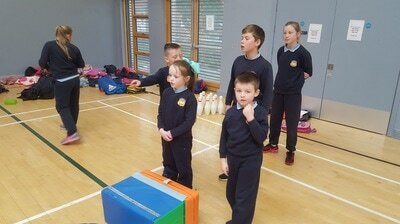 The children put in great performances. Some returning with medals and all returning with smiles! 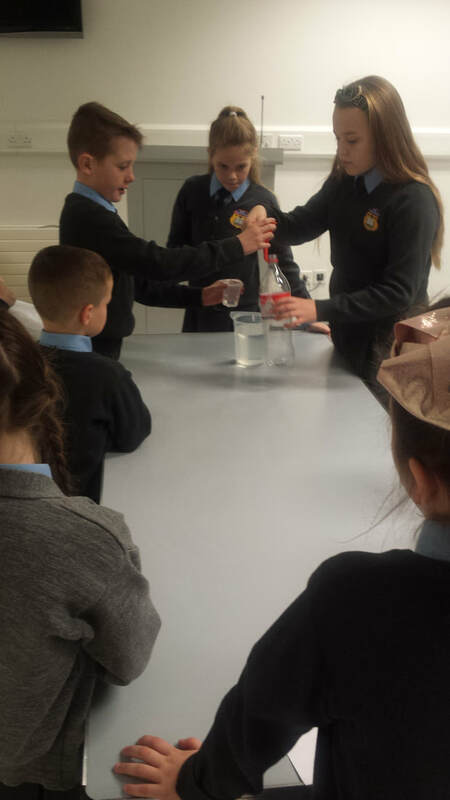 Congratulations to Justin, Emma, Michael and Caoimhe who celebrated their Confirmation Day yesterday. The mass was celebrated by Archbishop Diarmuid Martin. We are all very proud of our 6th Class. 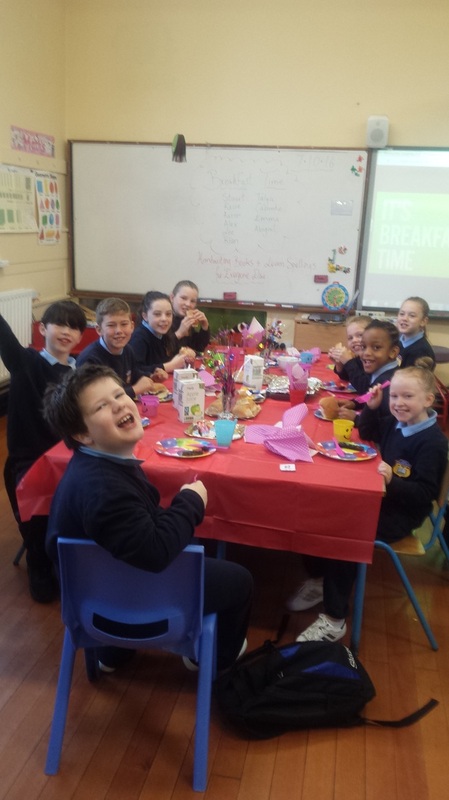 Congratulations to 6th Class who earned 5 attendance medals and chose a cooking session with Ms. O'Farrell. 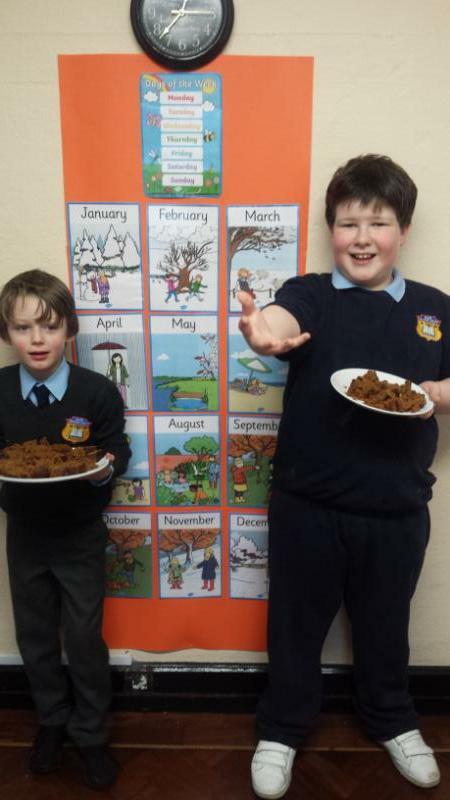 They made delicious homemade burgers with fresh herbs from our school garden. They were very tasty! 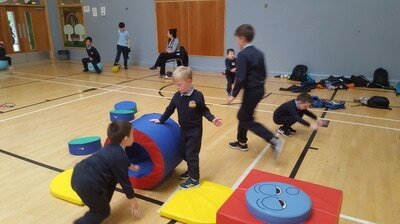 Junior and Senior Infants had a 'Literacy for Fun' session this morning with their Moms. We had a wonderful turnout. 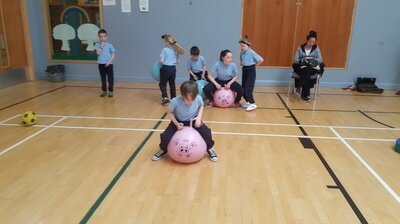 Everyone enjoyed playing the games which were supervised by some of the 5th & 6th Class children. 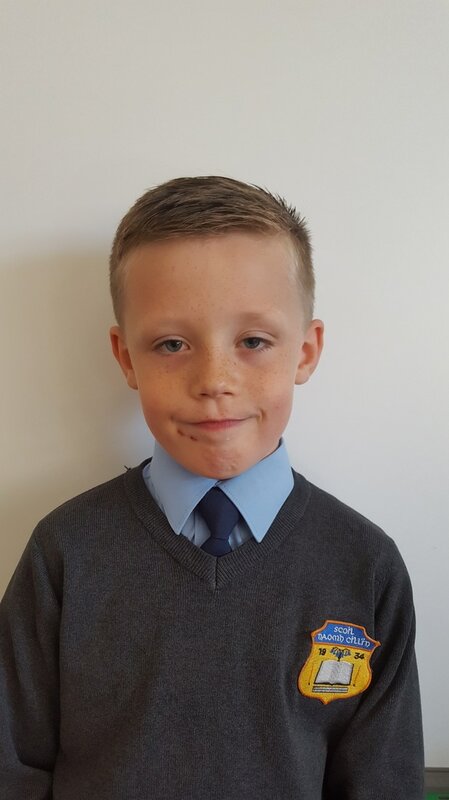 Congratulations to Justin (6th Class) for his top 25 finish at the Dublin Spelling Bee Final. There were over 70 competitors in attendance. 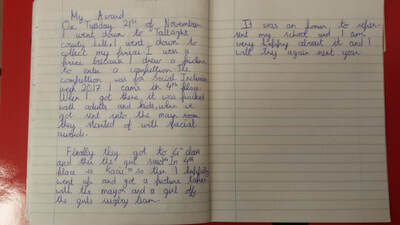 Justin also celebrated his 13th birthday on the day. Parents Association Meeting - Thursday 19th April @ 7pm in St. Cillian's. All are welcome. 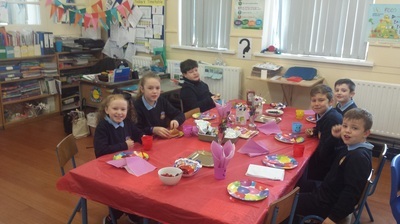 Jordan, Mya, Leon and Matheus are busy preparing artwork for their Holy Communion celebration in Our Lady of the Wayside Church on the 22nd April. Congratulations to Sharon Wilson (Leah's Auntie) who was the winner of our Easter Hamper. 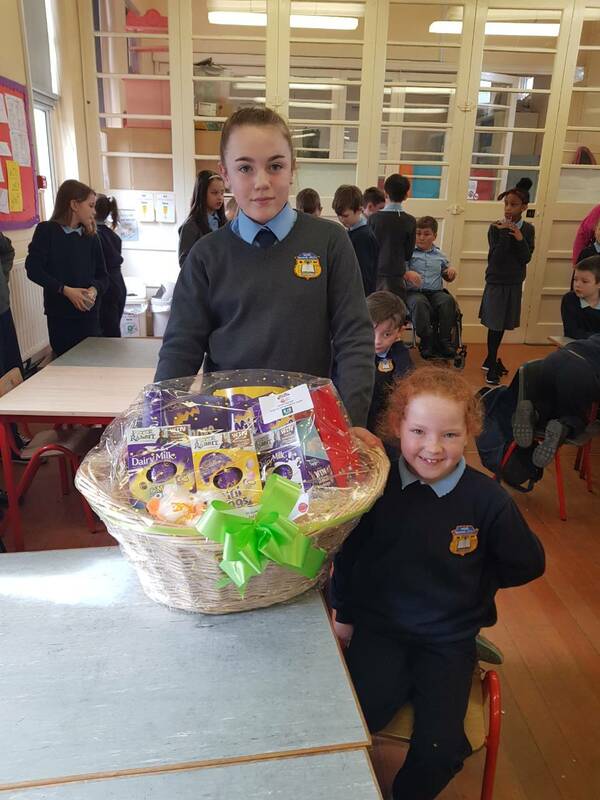 Pictured is Leah accepting the hamper from Caoimhe. At the last count, the total amount raised was €380 but we will update you all with the final figure after Easter Break. 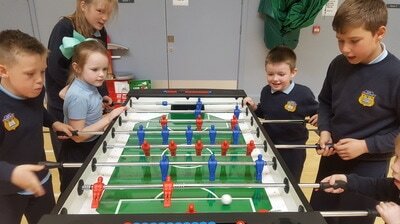 Thanks to all who bought and sold tickets for the Parents Association Fundraiser. 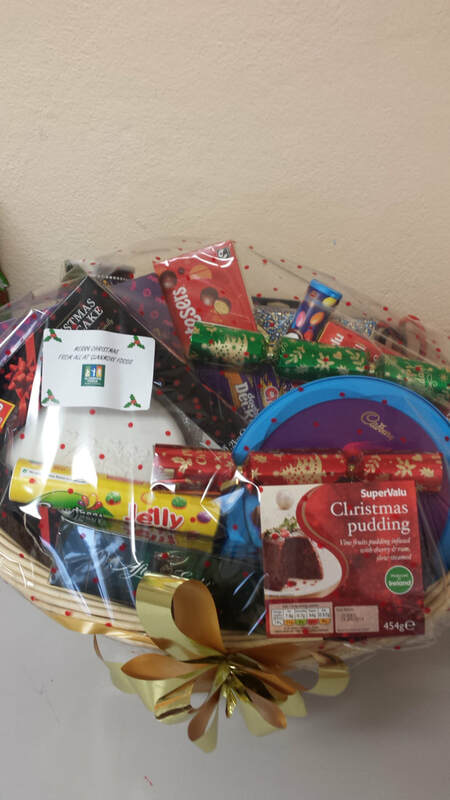 Also, a big thank you to Eric from Glanmore Foods who donated the hamper for our fundraiser. 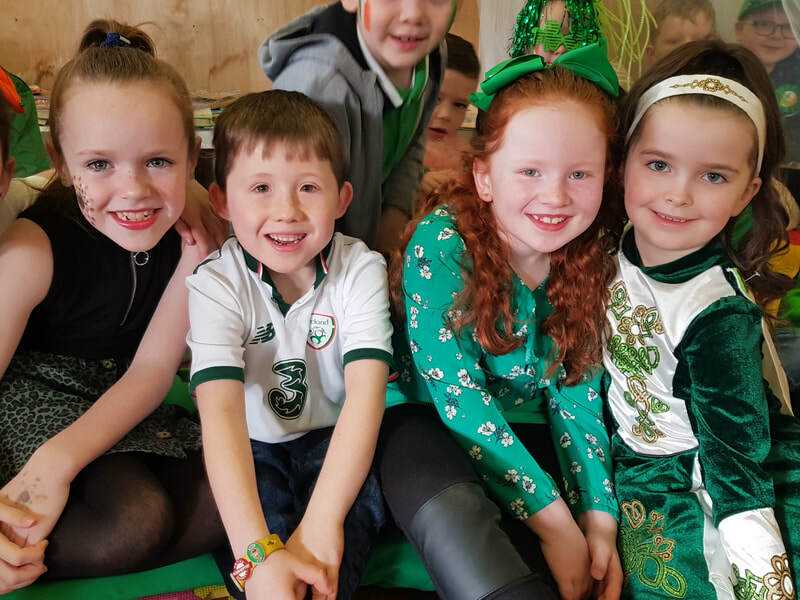 St. Cillian's will be closed this Monday 19th March for St. Patrick's Weekend celebrations. See you all Tuesday. 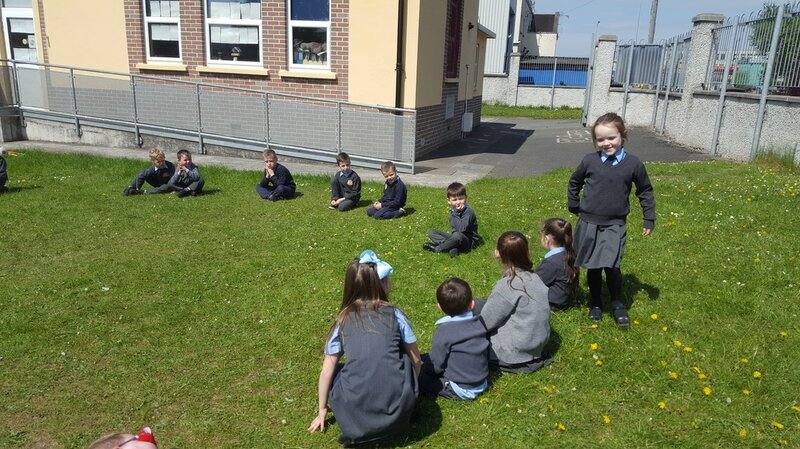 Congratulations to 1st and 5th Classes for earning 5 attendance medals. 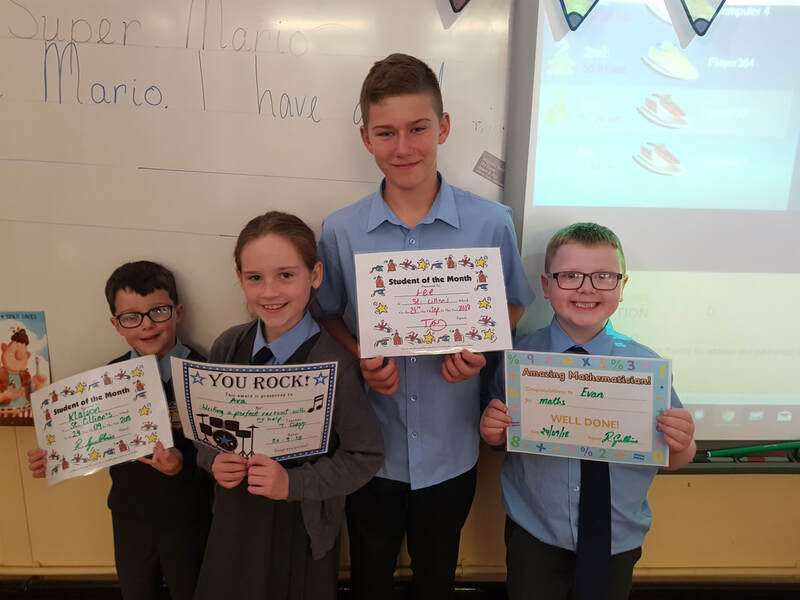 It takes a huge team effort to have perfect attendance and these children are proving that it's possible week after week. 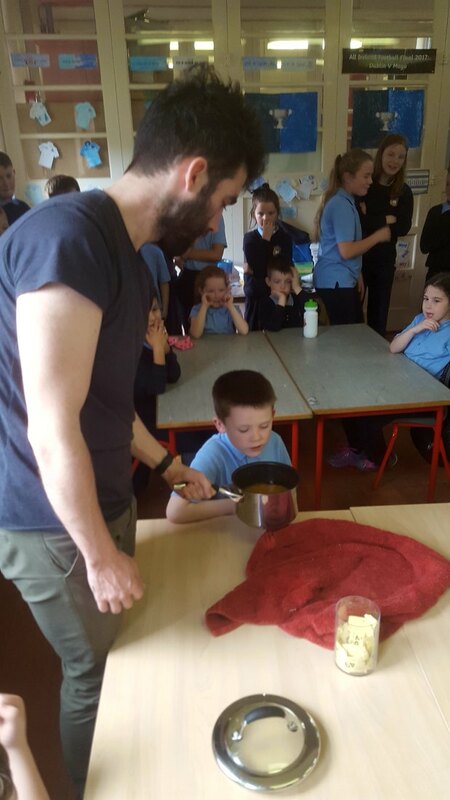 5th Class decided to cook chicken curry from scratch with Ms. O'Farrell. 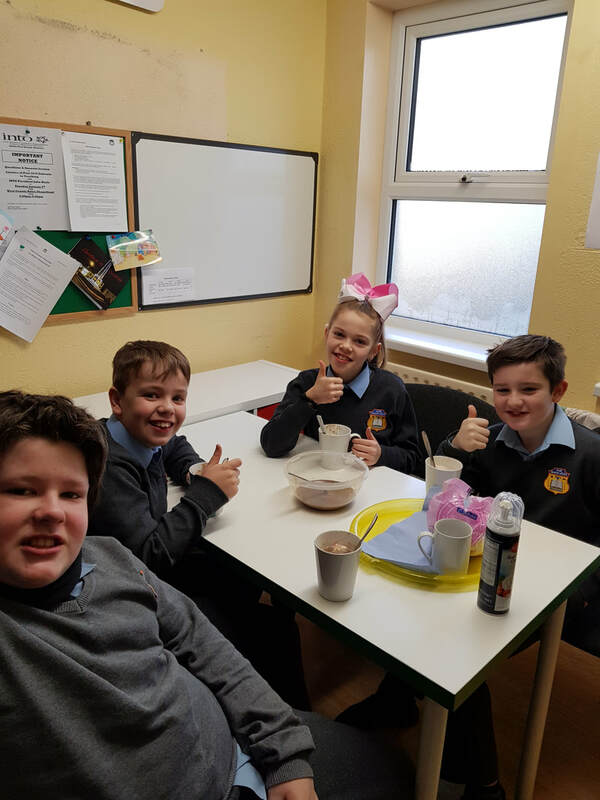 1st Class preferred the sweeter option of Galaxy hot chocolates. 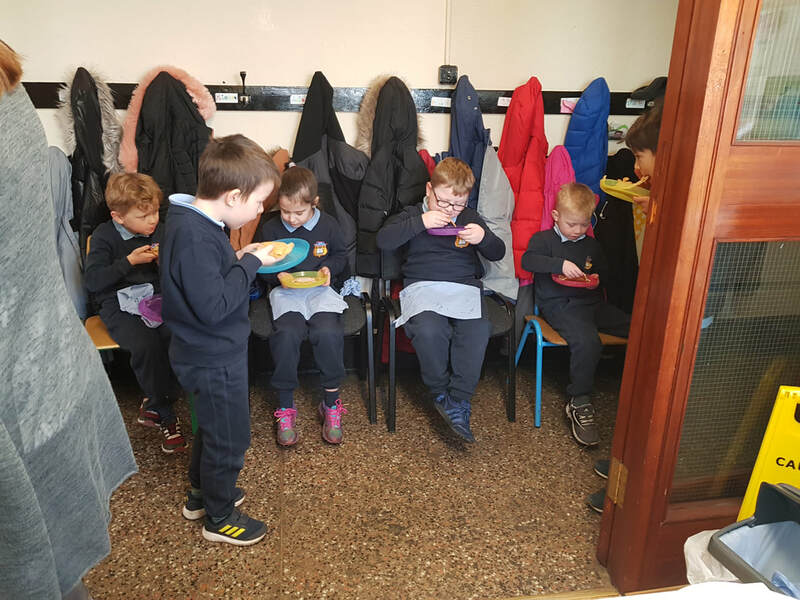 The children used adjectives (which we've been working on all week) like 'delicious', 'tasty', 'chocolatey' and 'yummy' to describe their Friday afternoon treat! 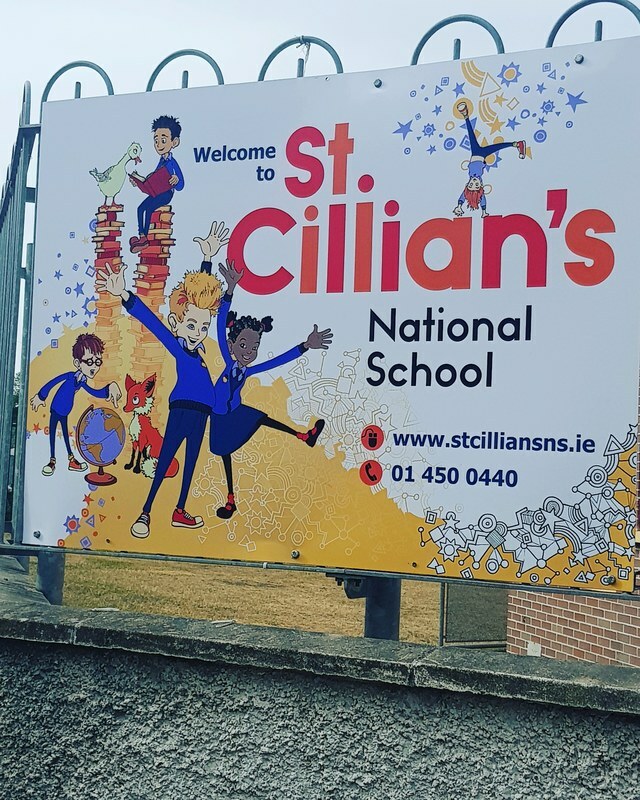 ST. CILLIAN'S N.S. WILL CLOSE TODAY 28TH FEBRUARY, TOMORROW 1ST MARCH & FRIDAY 2ND MARCH. ​SCHOOL WILL RE-OPEN MONDAY 5TH MARCH AT 8.50A.M. 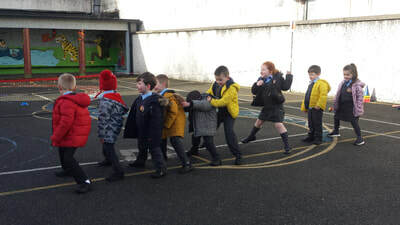 Our school will be closed to all pupils on Thursday 8th March for staff child protection training. We will also be closed on Friday 9th March for staff training in the new language curriculum. School will reopen Monday 12th March at 8.50a.m. 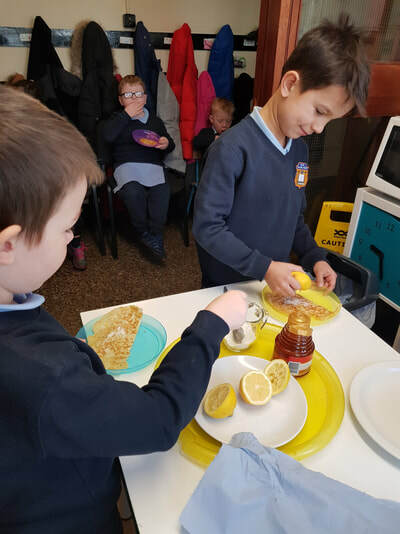 The beauty of going to a small school is that every child gets a freshly cooked pancake on Shrove Tuesday! 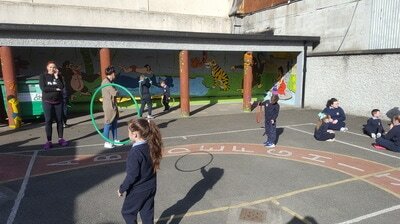 Congratulations to 5th Class who won their 5th Attendance Medal and got to pick a reward activity. 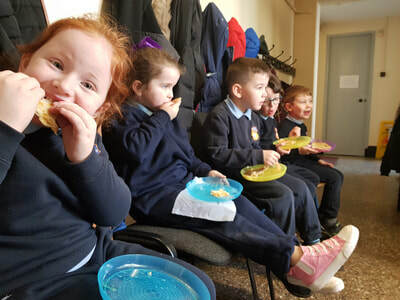 Last Friday, they decided to make homemade beef burgers for a delicious cooked lunch. 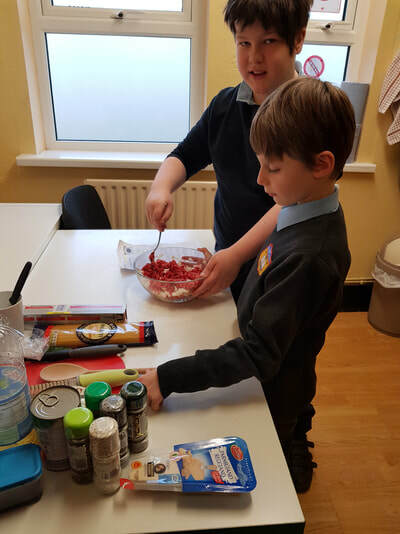 Ms. O'Farrell really enjoyed working with the group because they worked together and it was a very harmonious kitchen! 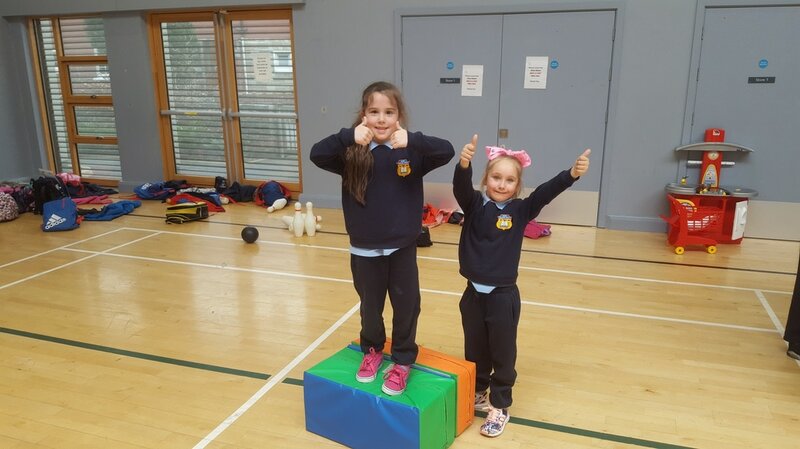 They are on track to earn their second 5th medal this week which is an amazing achievement. 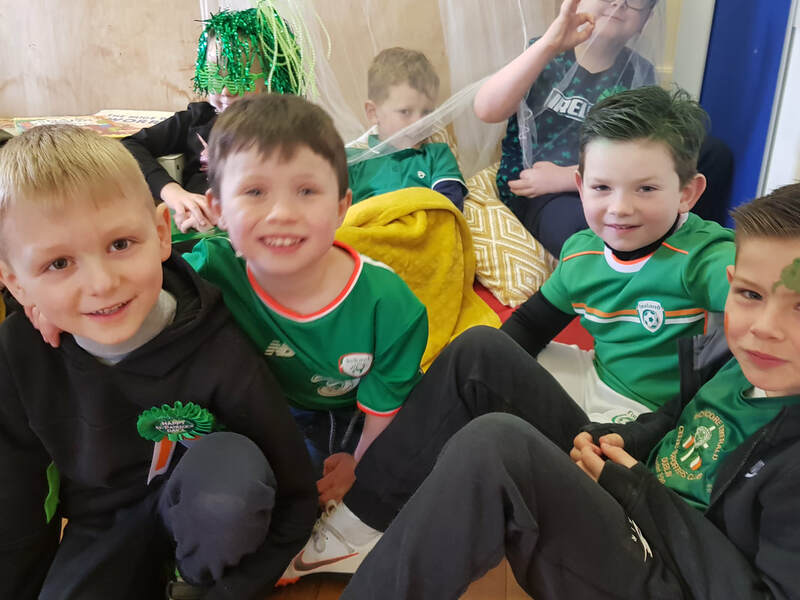 Huge credit to the children and their parents. Overall, our school attendance is improving each school year which is wonderful to report. We aim high and the results are beginning to reflect this. Average attendance for 2016/2017 was 94.1% and we are already at 94.8% for this school year. Let's keep aiming high and get that figure up! 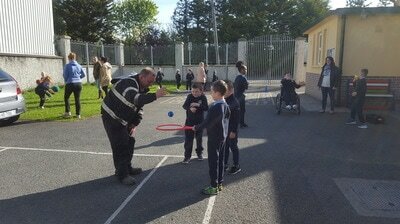 This morning saw Grandparents Day 2018 in St. Cillian's N.S. and what a wonderful turnout we had! 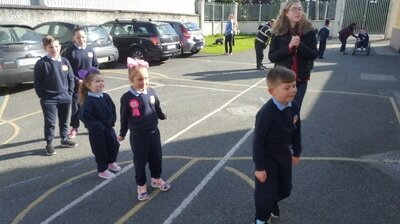 The children were so excited to have their grandparents visit their classrooms. 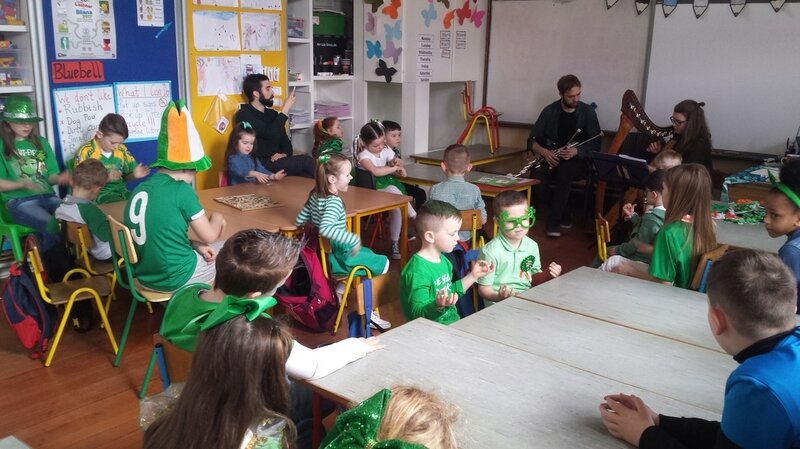 We enjoyed a rousing rendition of 'Dublin in the Rare Auld Times' in the Senior Room. 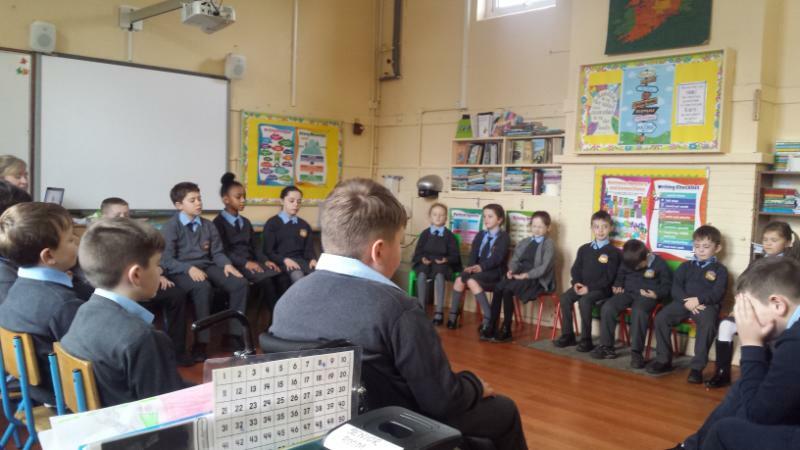 While in the Junior Room, the children took the opportunity to interview their grandparents. 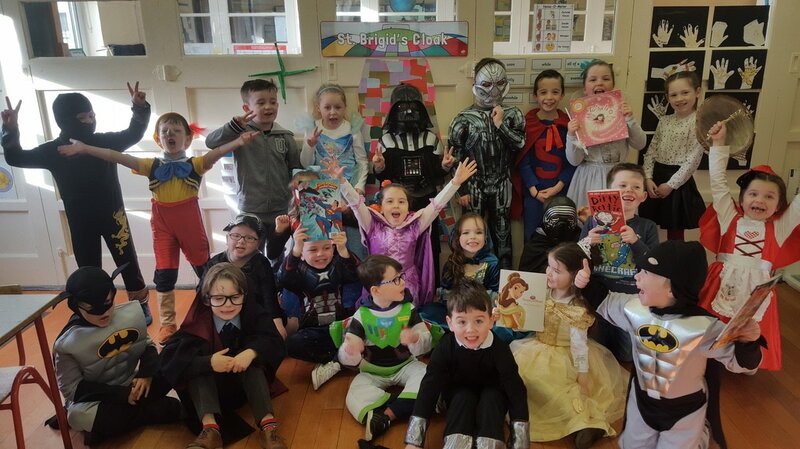 This is definitely one of our favourite mornings of the year in the school and we'd like to thank all who attended. 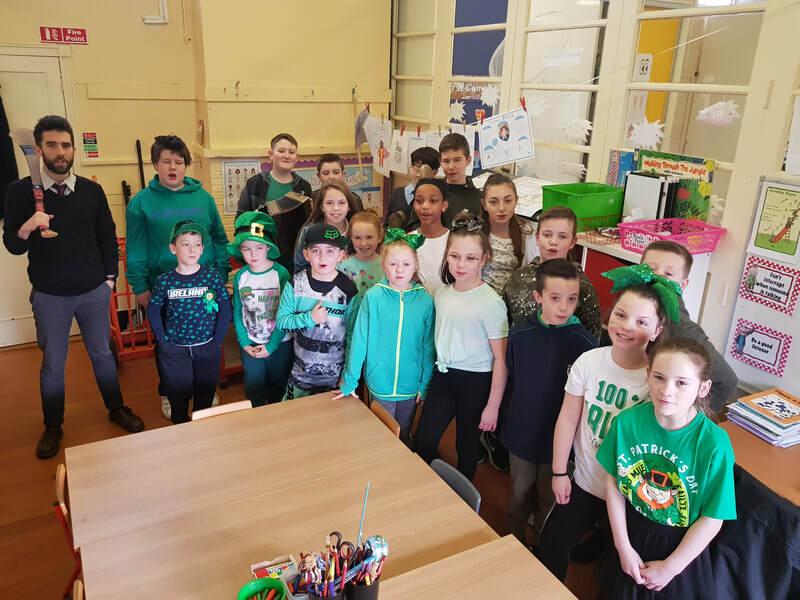 Congratulations to 4th Class who were the first winners of our 2017/2018 attendance award. 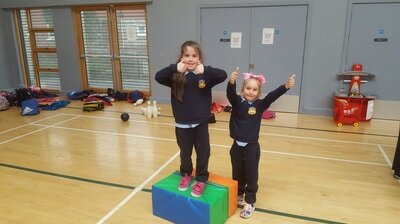 They worked really hard to earn 5 medals over the last couple of months. They decided to pick hot chocolate with cream and marshmallows as their reward. What a treat on a cold, breezy morning like this morning! Well done to Kacie, Leon, Stuart and Aaron. This afternoon, Jamie and Aaron cooked spaghetti bol. for 30 of their classmates! 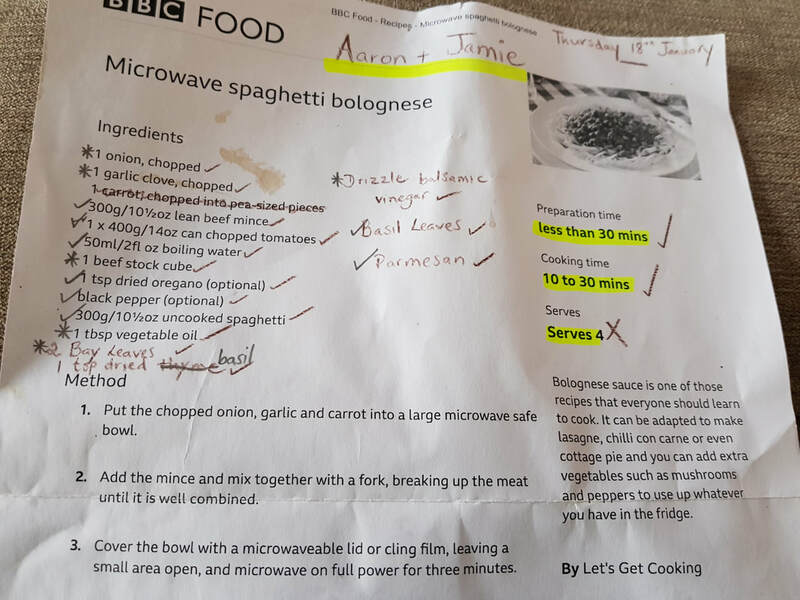 The boys used a recipe from the BBC Good Food website (we've included it here). 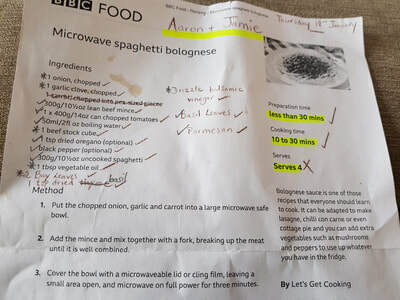 They used a variety of herbs like oregano, basil and parsley to add flavour to the meat. 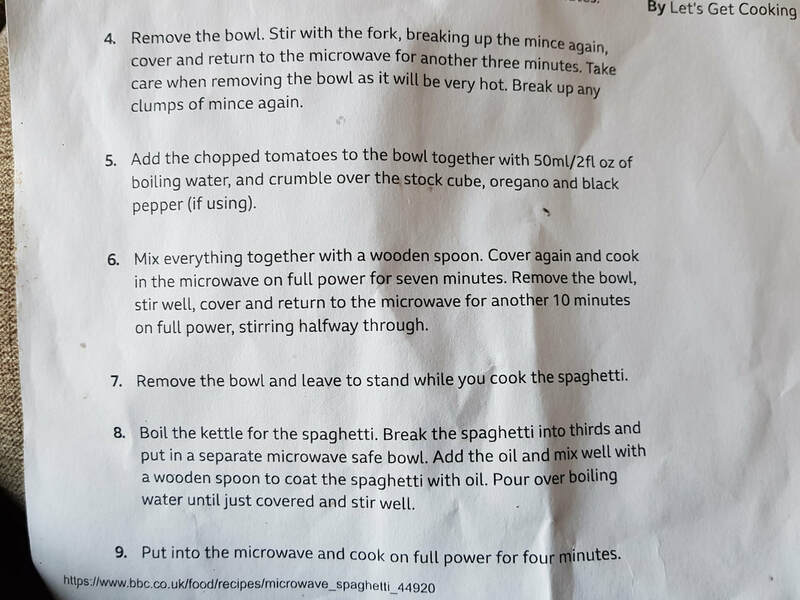 They also added garlic, onion, beef stock, balsamic vinegar, tomatoes and bay leaves. 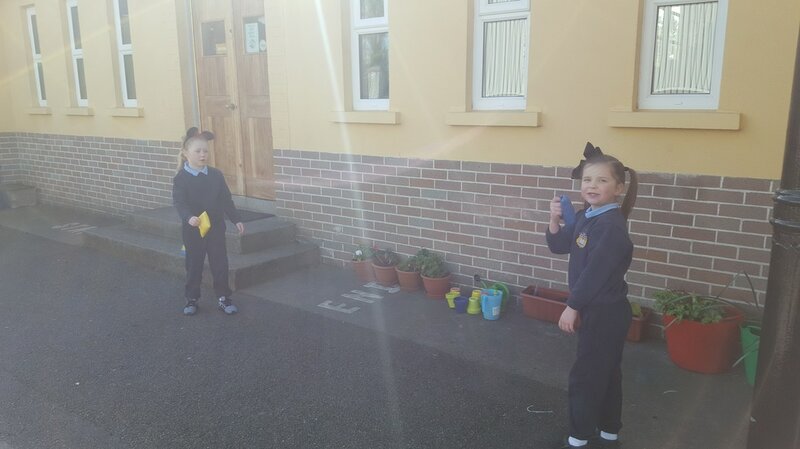 The smell in the school was amazing! Some visitors even said it was 'mouthwatering'! 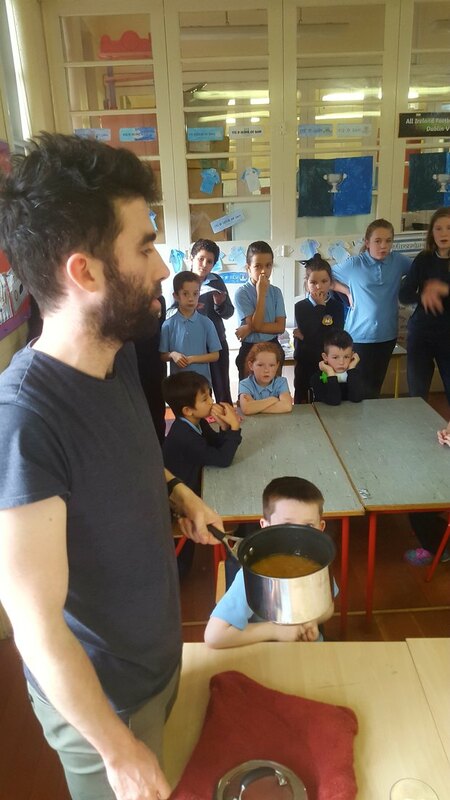 We're already looking forward to our next cooking session. Matheus sees snow for the very first time! 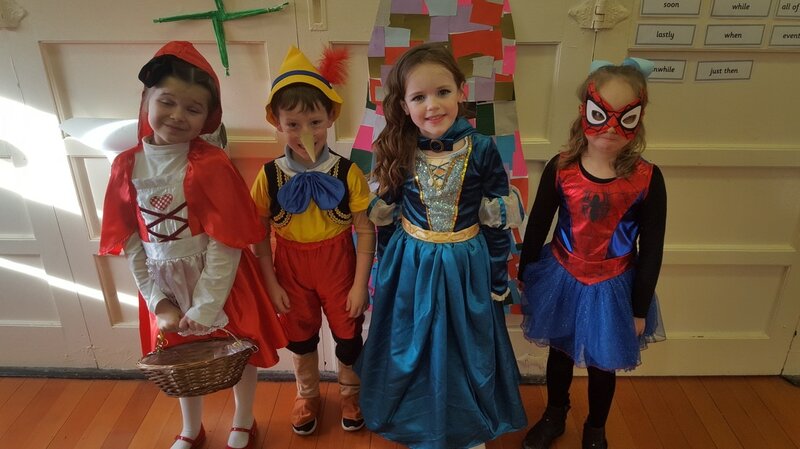 We are delighted to announce that we raised €1,200 through our Christmas Concerts and hamper raffles. 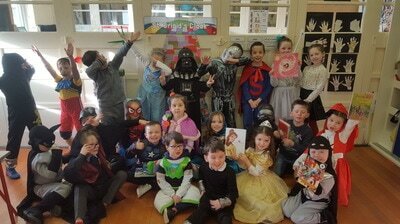 Huge gratitude to our Parents Association who organised the raffle tickets and hampers for both events. Also, a big thank you to Bluebell Community Centre for lending us chairs. And lastly, well done to the children for driving ticket sales and the 6th Class children for manning the door and entry to both concerts. We are thrilled with the amount raised and the wonderful atmosphere we had in the school over the two days. 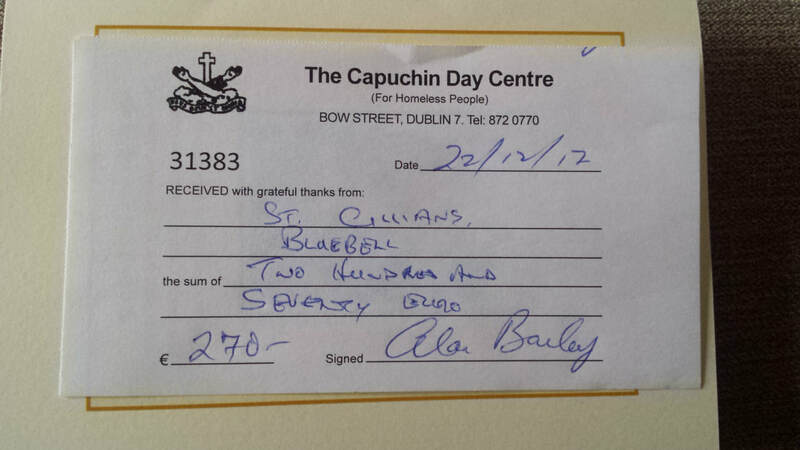 Many thanks to the children and parents of St. Cillian's for donating so generously to our annual Capuchin Centre Appeal. Instead of gifting presents to teachers & SNAs, the children are encouraged to donate the cost of a gift to the homeless. 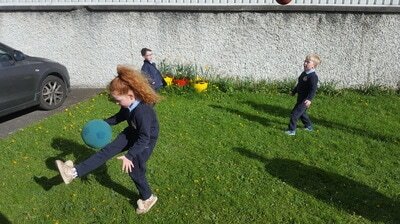 For a small school, we donated a healthy €270 which the Centre gratefully accepted this afternoon. Our Christmas Concerts were a huge success with super plays, singing as Gaeilge, recorder & tin whistle, ukulele, piano, dance, poetry and Irish dancing. What a display of talents! 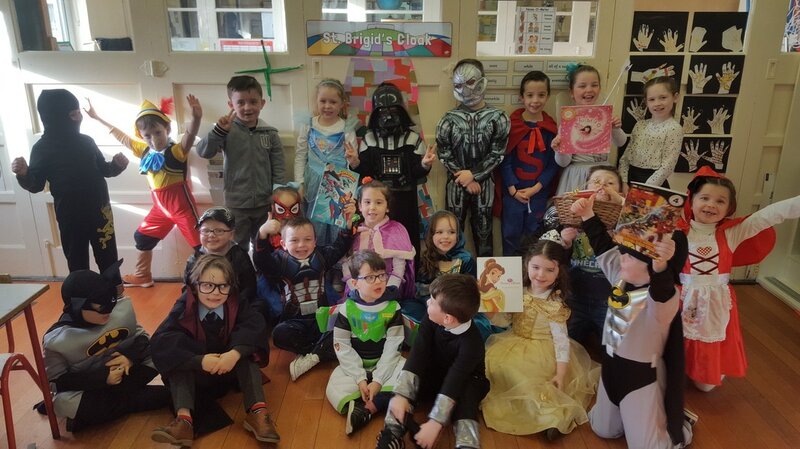 The children and their teachers worked tirelessly to put together two great shows. We had a fantastic turnout and we'd like to thank all those who attended. Our Parents Association organised raffles and our children sold an extraordinary amount of tickets. 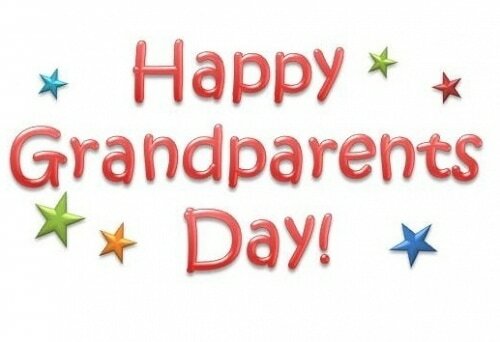 Well done to our winners: Stephania (Ianis's Mom), Stuart's Granny and Gerard (Jordan's Dad). Total amount raised will be announced in the New Year. Many thanks to all involved. 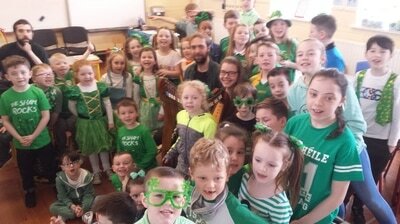 Both concerts will be held in St. Cillian's N.S. 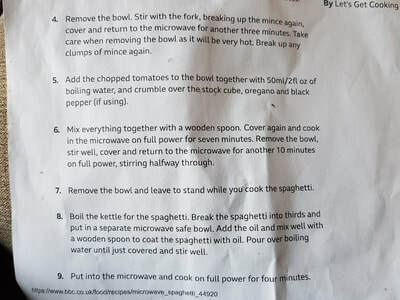 Children can invite 2 guests each. Numbers are limited due to space restrictions. 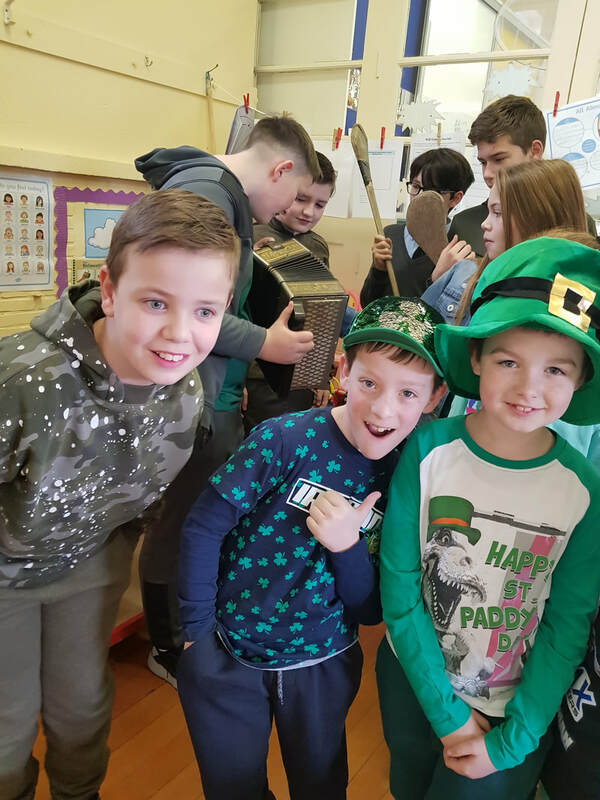 An entry fee of €5 will be charged at the door which will include a great morning's entertainment, a strip of raffle tickets for our hamper draw along with light refreshments after each performance. 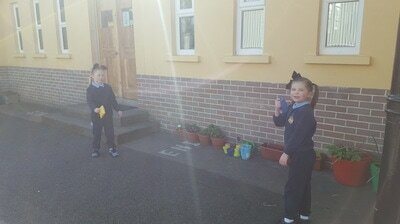 The children of St. Cillian's will be selling raffle tickets as a fundraising drive for our school. Tickets available from all the children. €2 per ticket or a book of 3 for a great value €5. Please support generously. Many thanks to all of you who attended the Book Sale last Friday. Organised by Mr. O'Donovan and the Senior Room children, we raised a healthy €71. 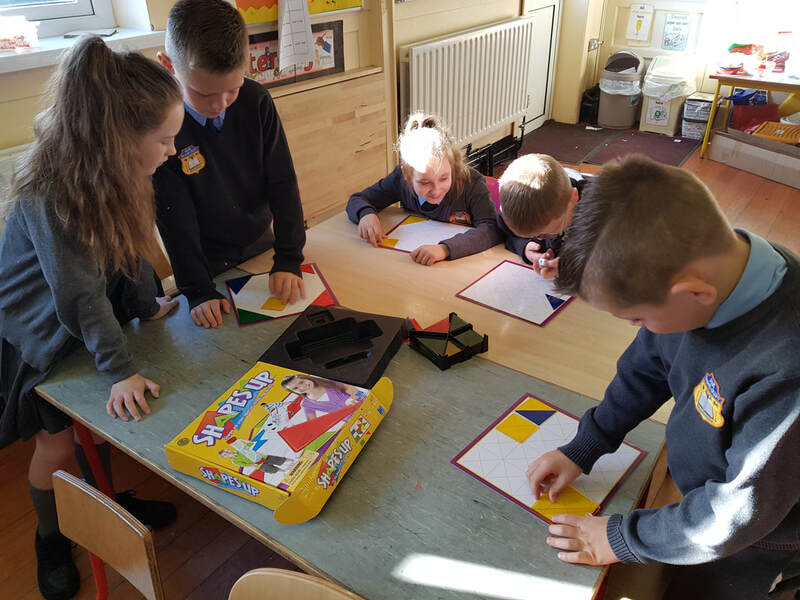 Maths 4 Fun kicked off today in the Junior Room. 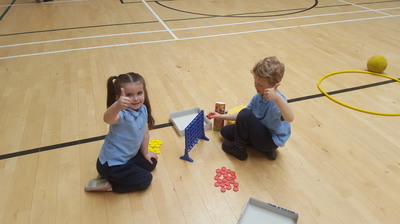 1st and 2nd Classes along with their families played maths games. 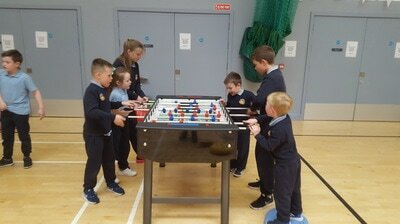 6th Class, Mr. O'Donovan and Mr. Gubbins manned the game stations. 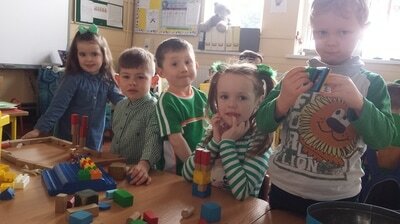 It was great to see parents, grandparents and aunties come along and we hope we'll have as many visitors again next Thursday. 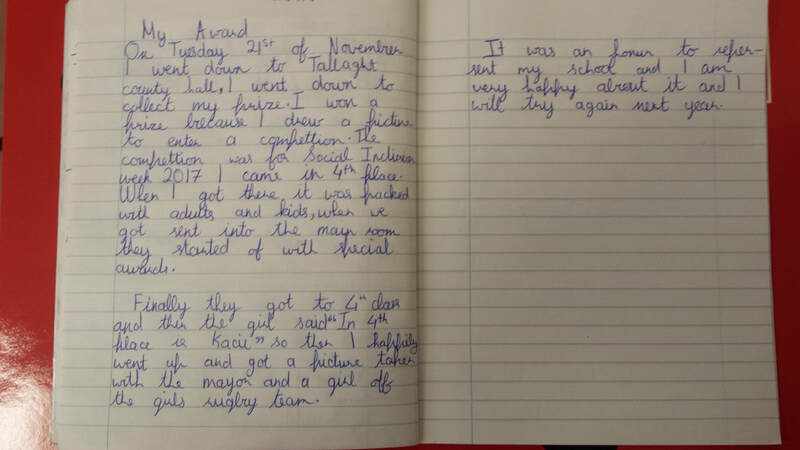 Congratulations to Kacie in 4th Class who was a prizewinner as part of Social Inclusion Week 2017. 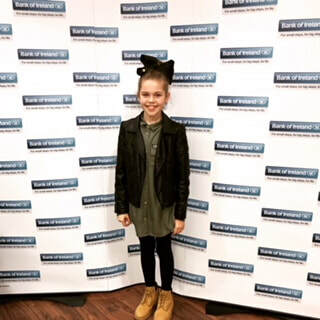 Kacie created an illustration as part of the awareness week and was recognised for her work at a reception in County Buildings in Tallaght during the week. 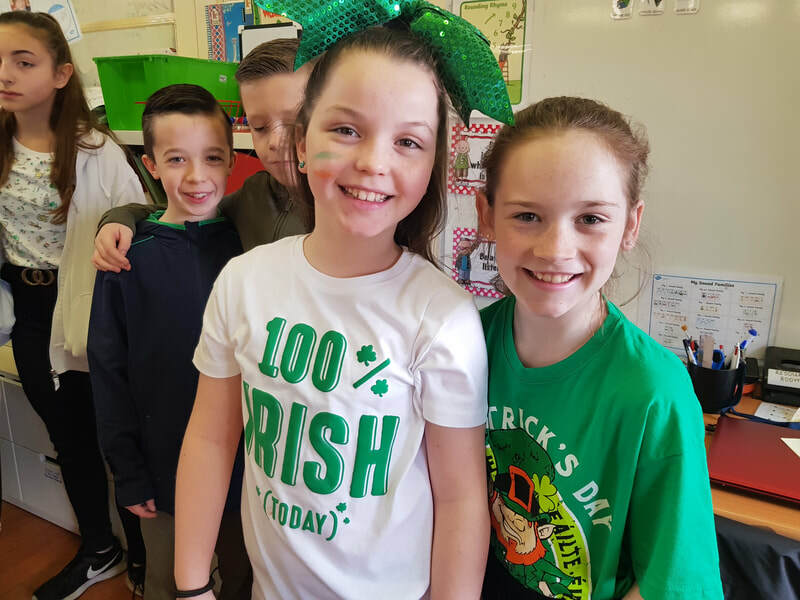 We are all very proud of you...well done. 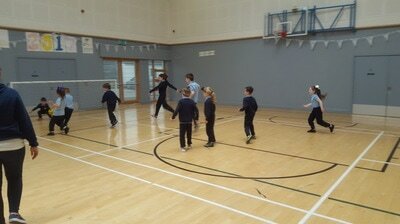 Thursday sees Arek our Tennis coach attend St. Cillian's NS. 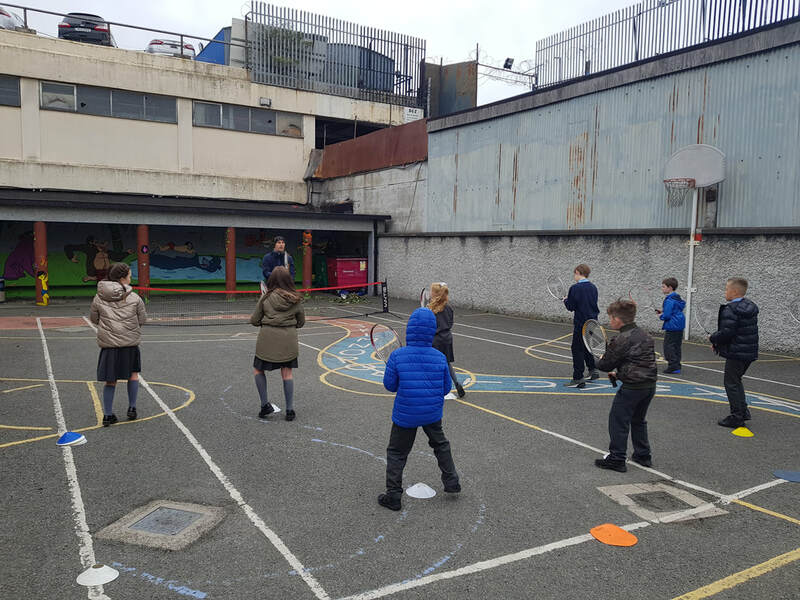 This term Juniors, Seniors, 1st and 2nd classes are learning the skills of tennis. Fast eyes, fast hands and fast feet are all required for the game. 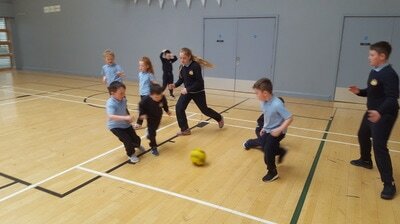 Here the Juniors and Seniors display their fast feet with the game 'Torpedo'! 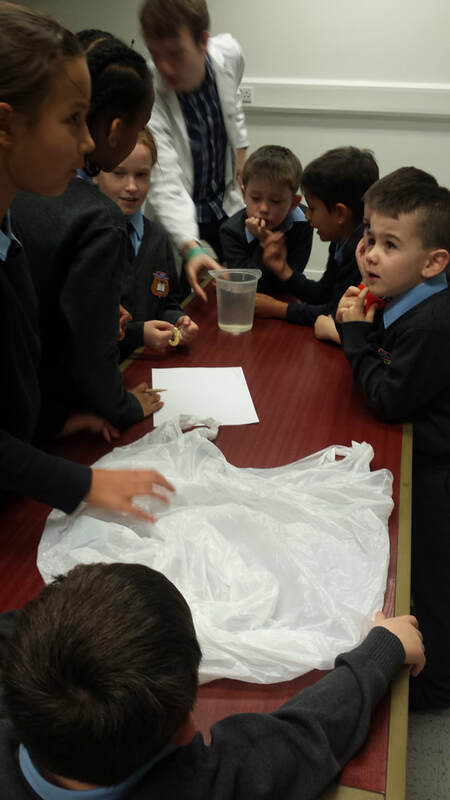 Science Week 2017 saw the children of St. Cillian's attend a workshop at Tallaght Library. 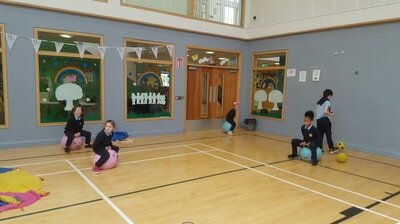 There the children experimented with the idea of force and strength using jelly sweets. 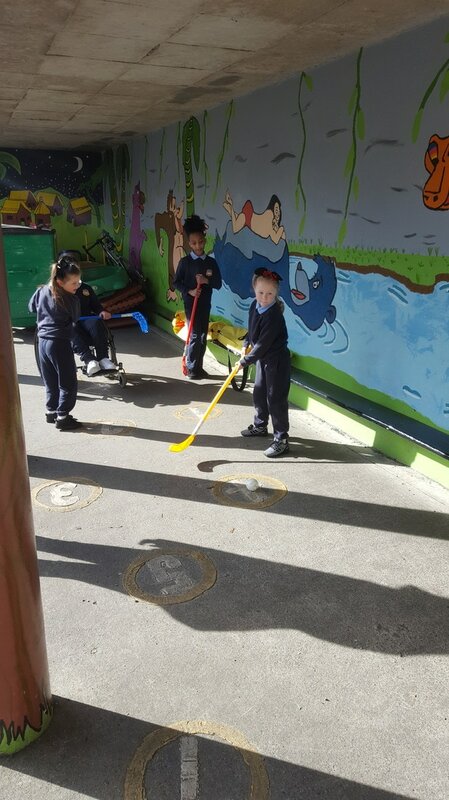 Junior Infants to 6th Class took part in the trip. It was wonderful to see everyone learning from each other. 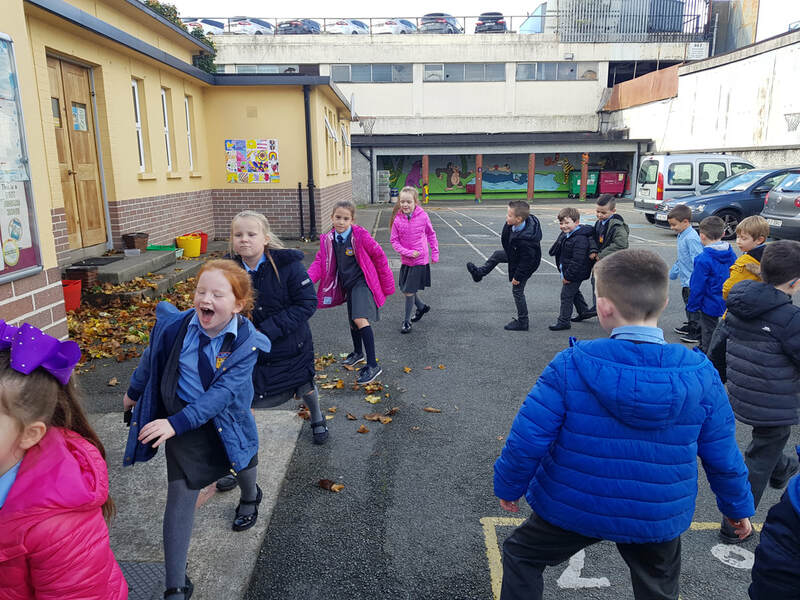 Ophelia won't ruin our Maths Week! On Thursday 5th October at 7.30pm, Archbishop Diarmuid Martin will celebrate Mass with us to mark this very special occasion. 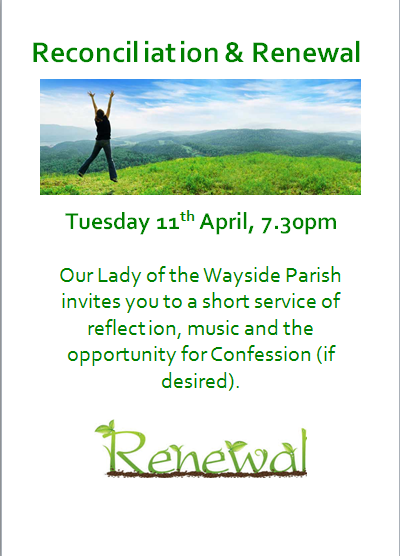 *Latest news from Our Lady of the Wayside parish. 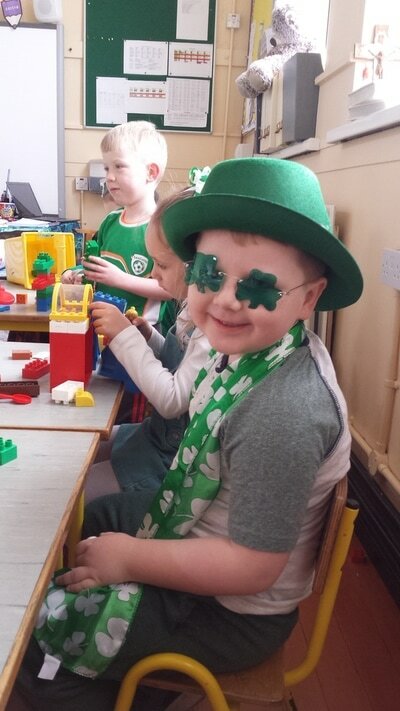 As part of our St. Patrick's Day celebrations, our Parents Association organised a dress up day on Thursday 16th March. The children made a wonderful effort and got into the theme of the event with gusto! 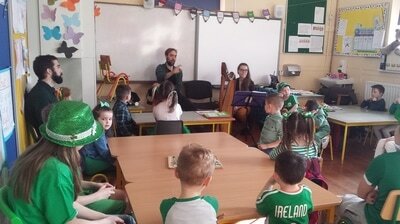 Mr. Daly organised a workshop of Irish music with Fionn & Anna. Fionn plays the Uileann pipes while Anna plays the harp. 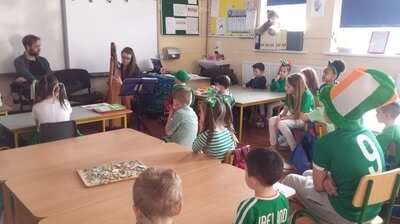 Both musicians spoke about their instruments and the children had an opportunity to ask questions. 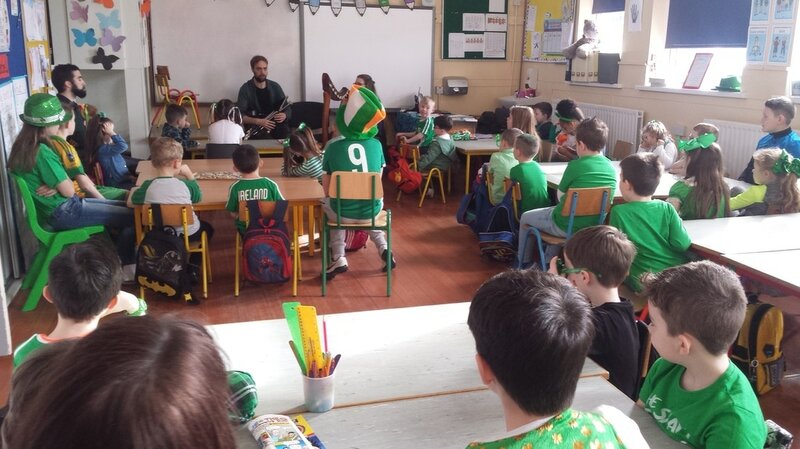 Fionn displayed the story telling ability of the pipes by playing 'An Maidrín Rua' and explained how the different parts told the story of the the fox, the farmer, the hounds and the outcome of the chase. 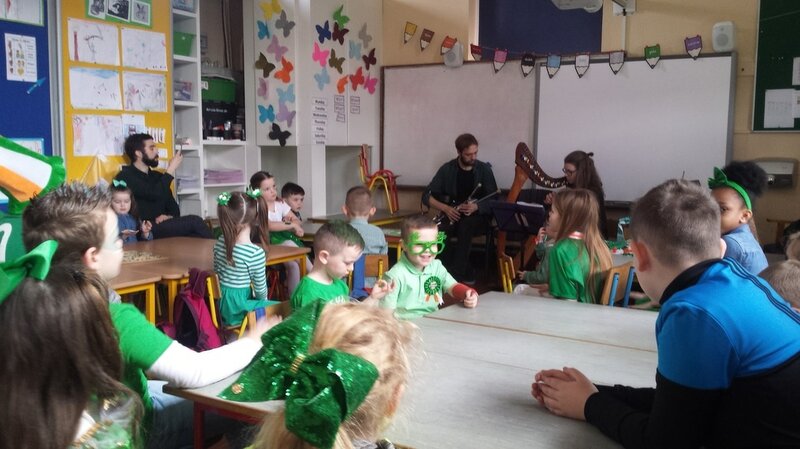 To see and hear our native instruments live and up close was a fantastic experience for all the children. 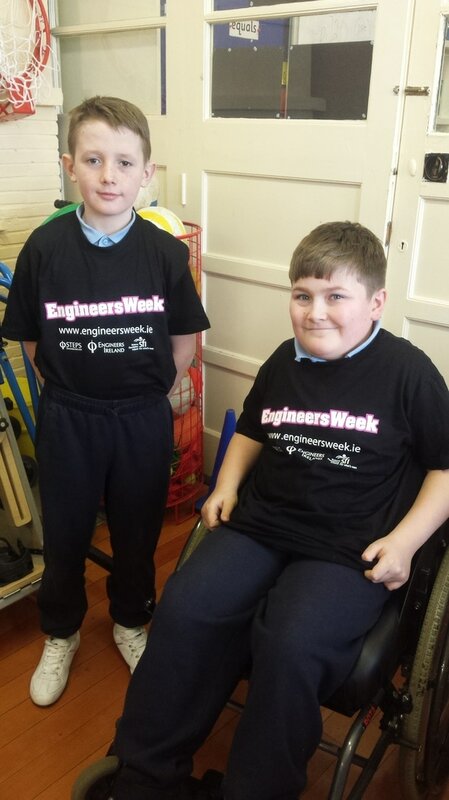 We welcomed two engineers to our school as part of Engineers Week 2017. Harriet and James spoke to the children about their jobs and the different types of engineers. Harriet works as an engineer designing airport runways and hangars while James was a safety engineer making sure all the constructions are suitable for use. 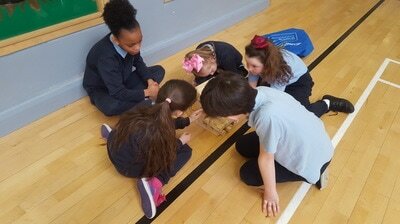 We enjoyed a hovercraft experiment with the engineers and a long Q&A session. On Friday, the Senior Room group attended a K-Nex Workshop at Tallaght Library. 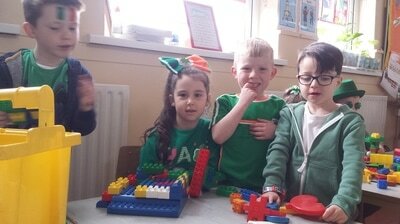 There was a bridge building challenge and I'm delighted to announce that the 5th Class team of Justin and Michael won the challenge! 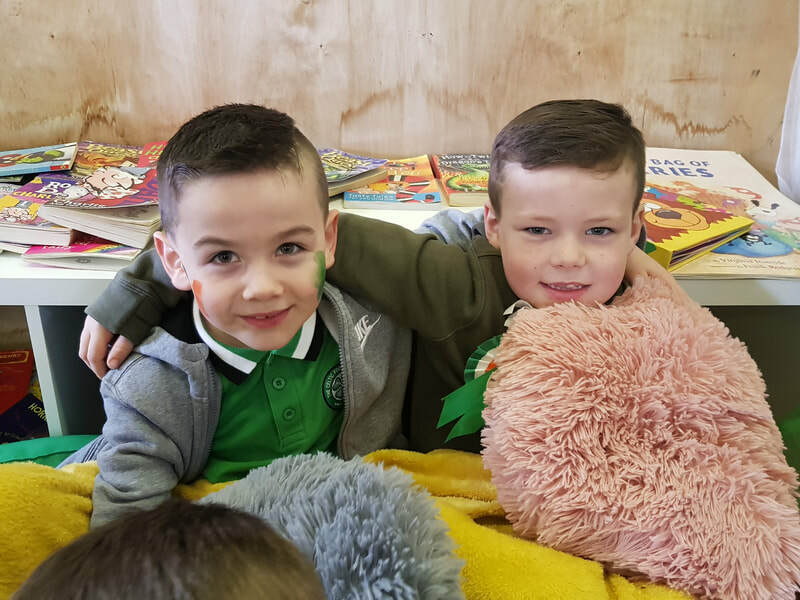 Both received t shirts as part of their prize. Well done boys! 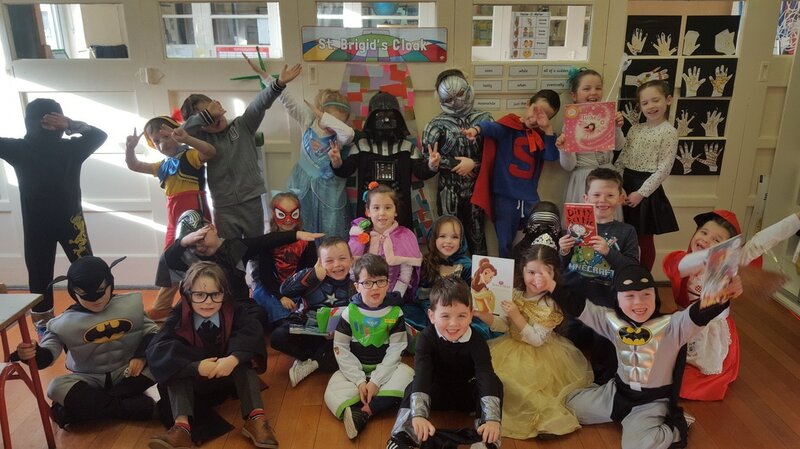 Welcome to World Book Day 2017....The children will be dressing up as their favourite book characters and there will be an individual class raffle for either a new picture book in the Junior Room or a David Walliams novel in the Senior Room. Good luck everyone! Pancake Tuesday is one of our favourite days of the year! 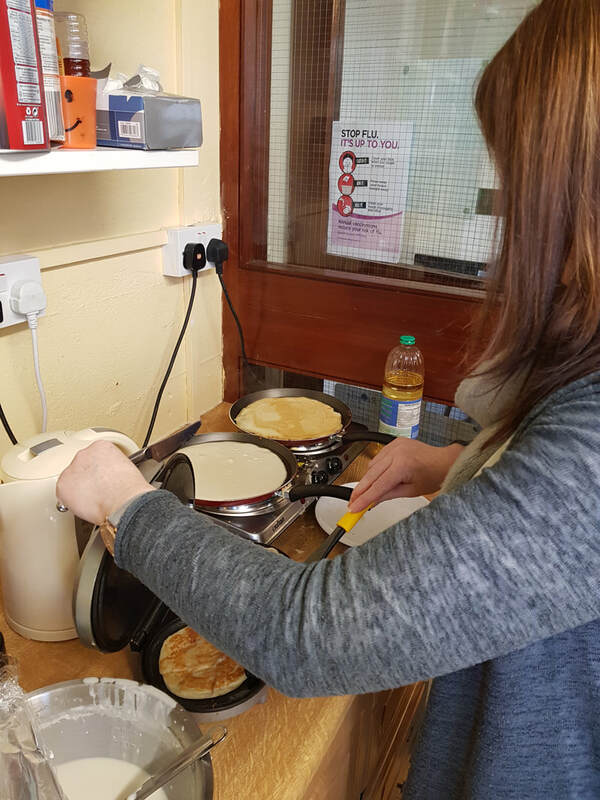 A huge thank you to Jillian for making the batter and cooking us all an individual pancake. They were delicious. 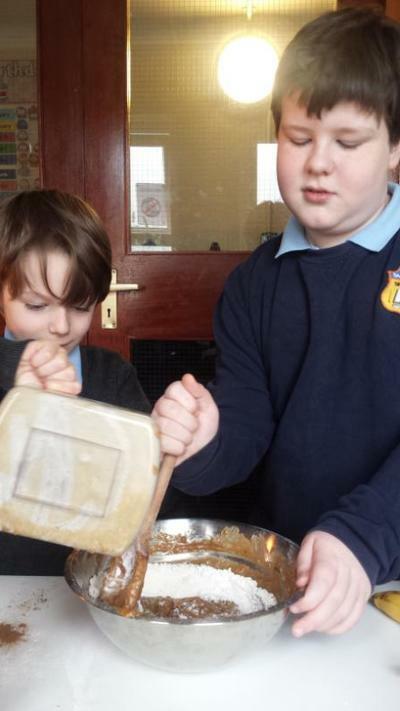 This Tuesday, Aaron and Jamie baked an egg and nut free banana cake for the whole school. The boys worked together as a team to follow the method of the recipe and measure out all the ingredients. 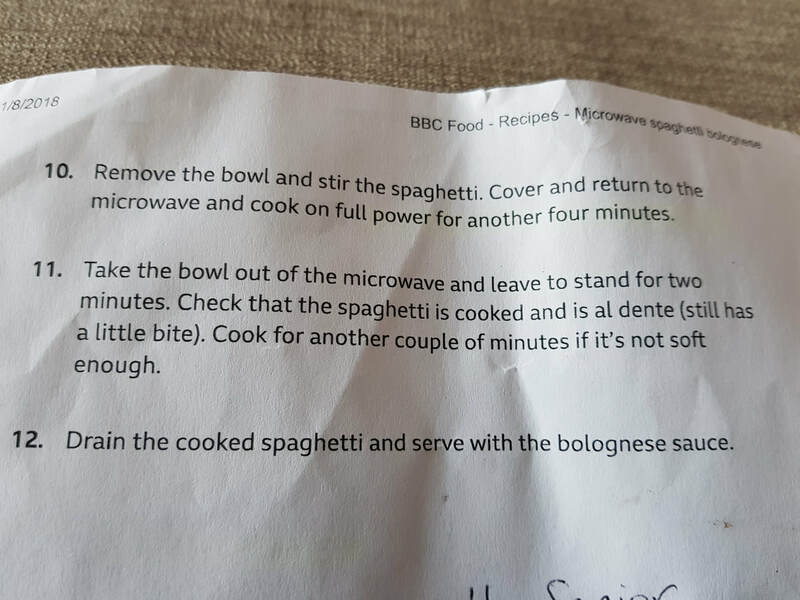 They even agreed to add some cinnamon even though it was a new flavour for them both. 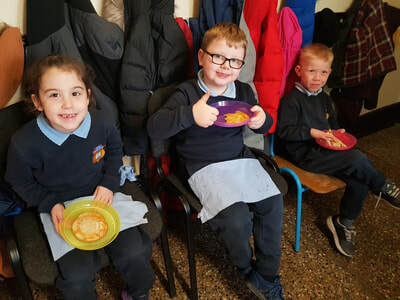 All their classmates and friends enjoyed tasting their cake and we heard lots of compliments for our two new bakers. 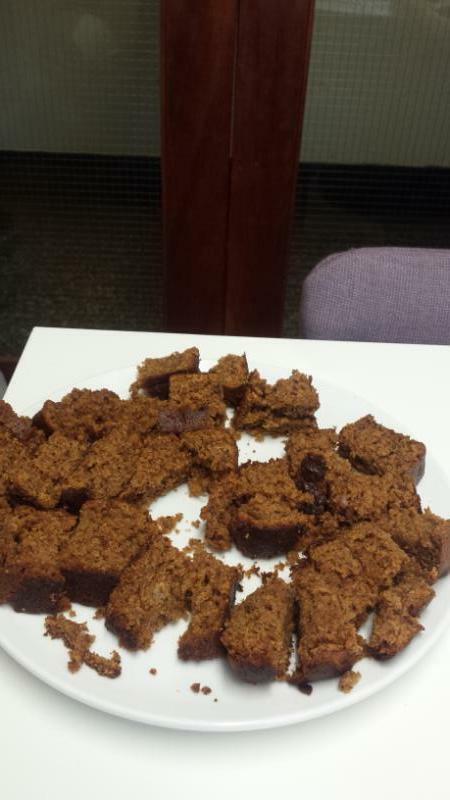 We all decided it was a delicious cake! 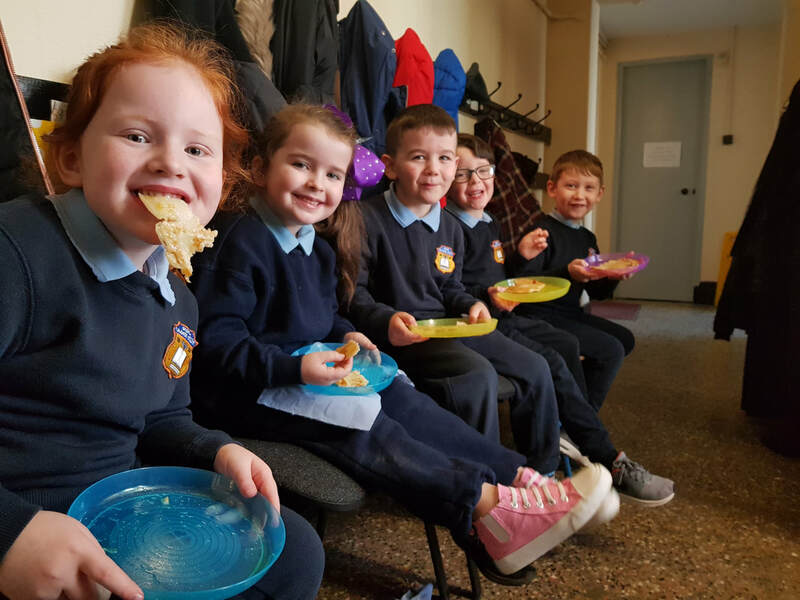 As part of Catholic Schools Week 2017, the children of St. Cillian's will be attending mass this Wednesday at 9.30a.m. at Our Lady of the Wayside Church. We will be celebrating the feast of St. Brigid, one of the best known and loved Irish saints. 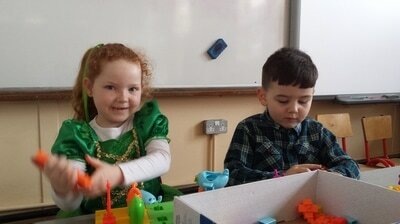 Also on Friday (3rd February), we are extending an open invitation to all grandparents, grandaunts and granduncles to come and visit our classrooms at 9a.m. 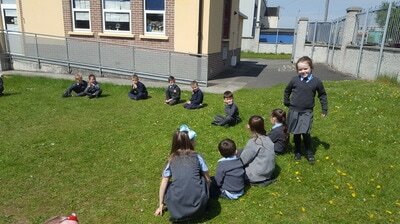 We will hold a shared reading session and hear some stories of school days gone by. 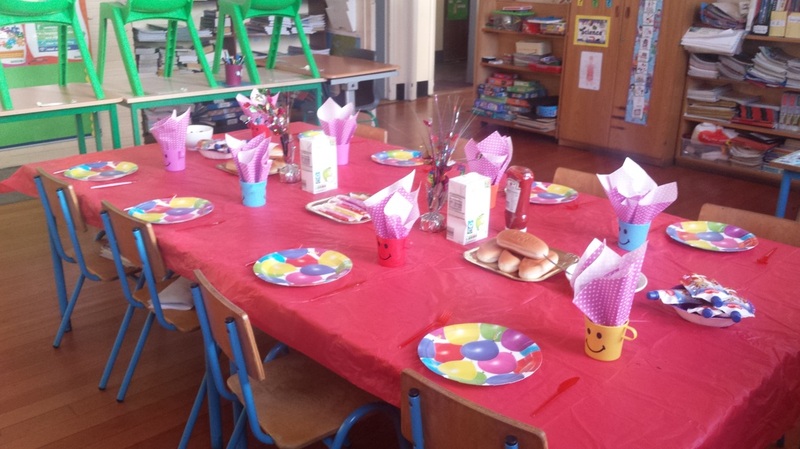 There will be teas and coffees served afterwards in the school staff room. We'd love to see you all there. The Sam Maguire Cup made a visit to our school. All the children made a huge effort dressing up in their Dublin blues. It was wonderful to be so near the famous cup. Ms. O'Farrell hopes to see it in the hands of the men from the Kingdom this September 2017! However, the Dubs may have different plans! 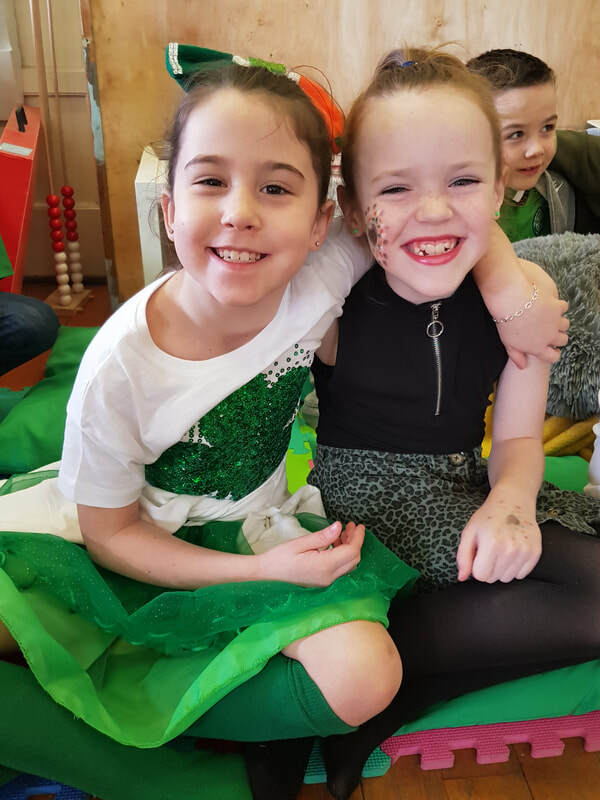 On Friday 16th December, the children of St. Cillian's put on a wonderful show for their parents, families and the community in Bluebell Community Centre. 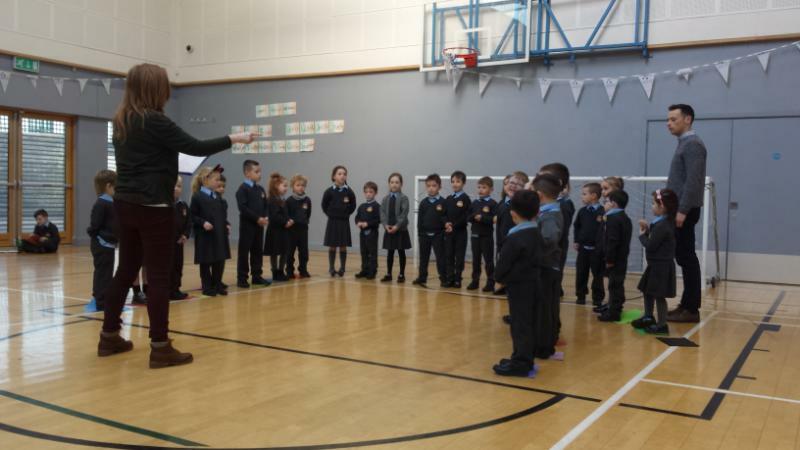 The concert began with the Junior Room and their rendition of 'When Santa Got Stuck'. 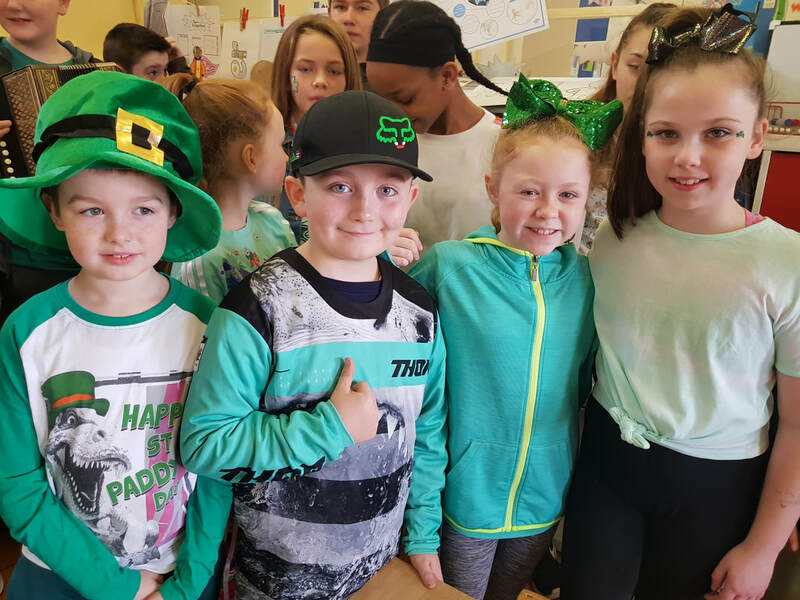 Everyone looked wonderfully festive in their jumpers and hats. The Senior Room performed their play called 'The Golden Binocular'. 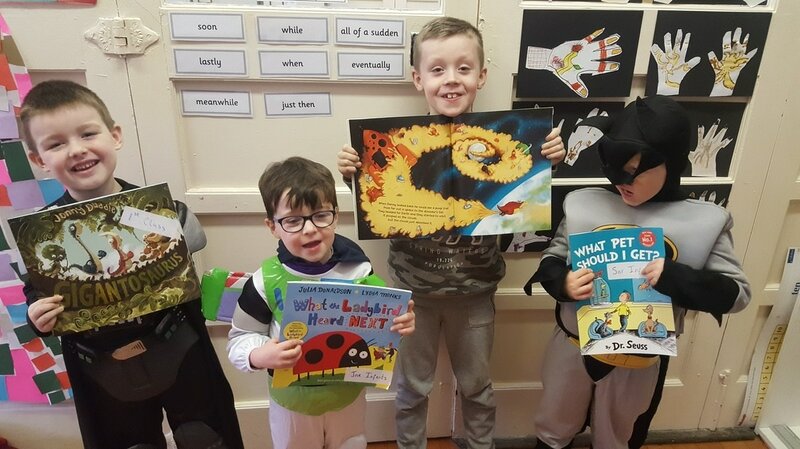 We had goodies and a few baddies thrown in .... Jack Frost was particularly cunning! You'll be glad to hear that everything worked out in the end and they all lived happily ever after! 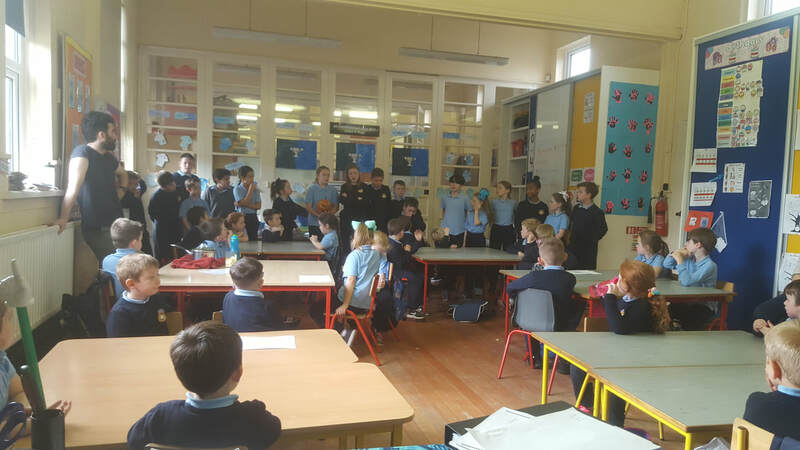 The children from 2nd to 6th Class performed a number of Christmas pieces on their recorders with the direction of Natalie, their recorder teacher. 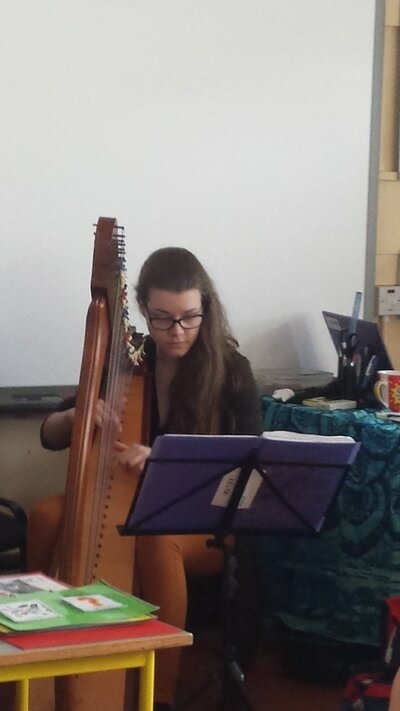 Great credit is due to all the musicians as they practiced both at home and in school. The finale of the concert was a huge sing song by all the pupils of St. Cillian's together with guitar accompaniment from Ms. Ruane on guitar and Mr. Gubbins on electric guitar. We'd like to thank the organising committee of the Parents Association for running a fundraising raffle after the concert. They put in a large amount of effort co-ordinating the collection of hamper contents, raffle prizes and spot prizes. We are very grateful for all their efforts. 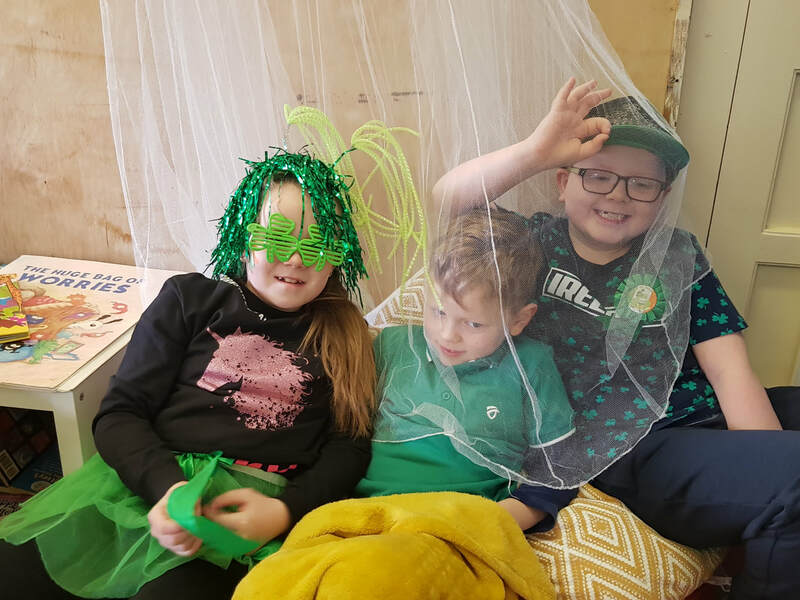 Also, a big thank you to Caroline and her team in Bluebell Community Centre for providing the venue free of charge and gifting a selection box to each child at the end of the event. 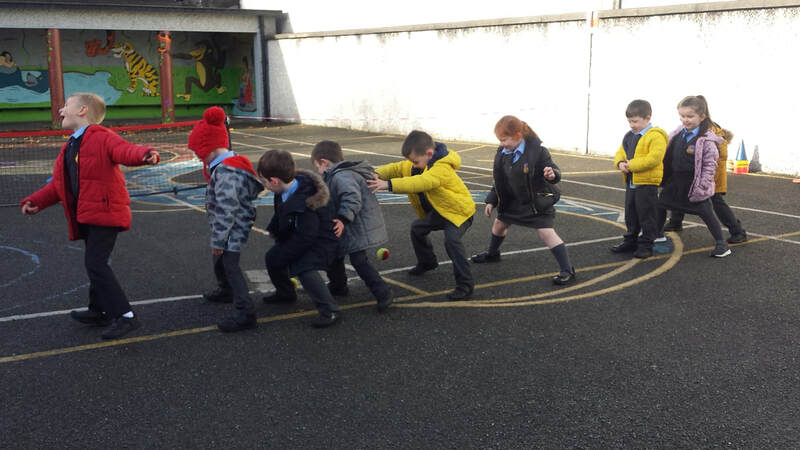 Finally, we'd like to wish all the children and families of St. Cillian's NS a happy and healthy Christmas break and we'll see you all on Monday 9th January 2017 in the line at ten to nine! 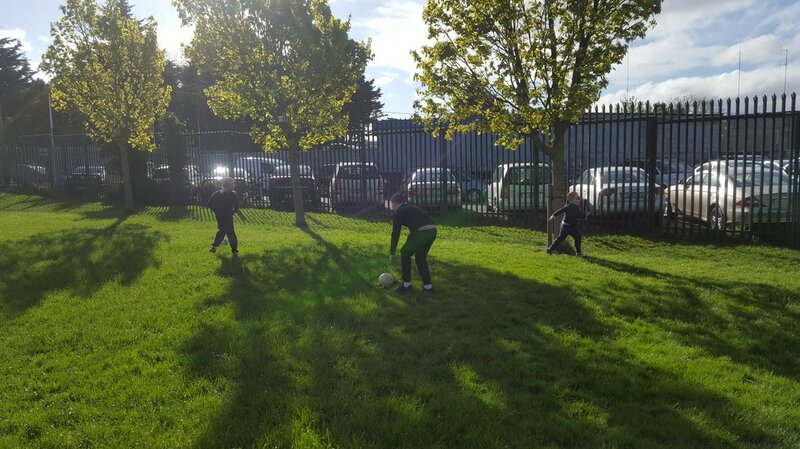 3rd to 6th Class took part in a 5 a side soccer tournament in Inchicore this afternoon. We were very excited to be taking part in an event that perfectly suited our numbers. 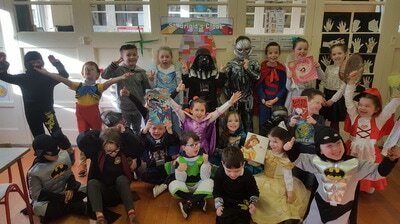 Undoubtedly, the children did themselves very proud. They drew all but one of their games. That one game was a victory! 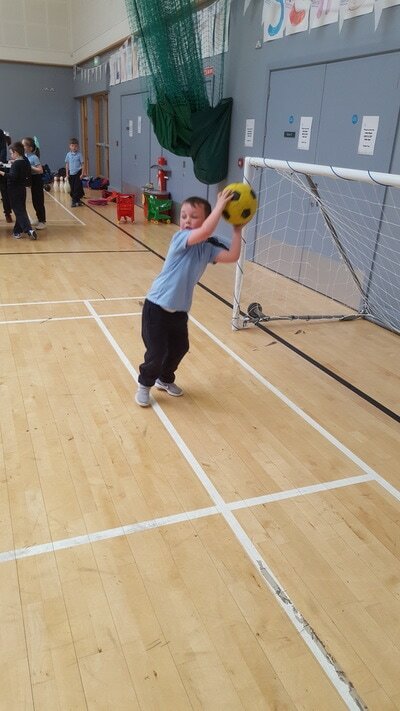 Everyone came home energised and excited about future soccer events. 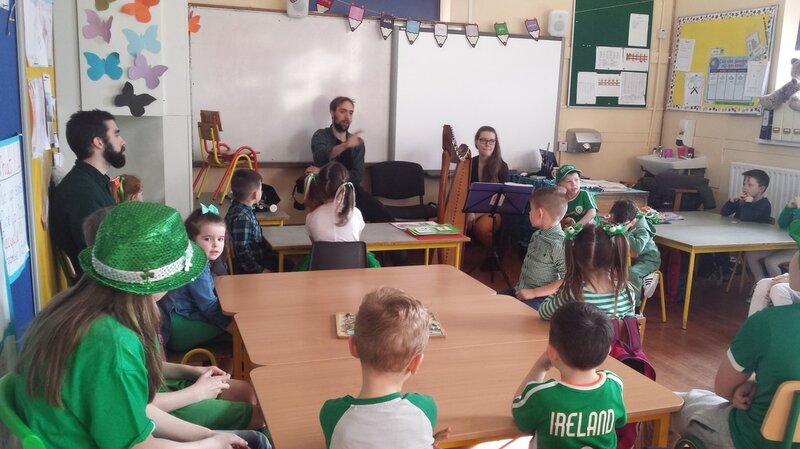 A big thank you to Mr. O'Donovan for organising our participation in the event. Enhancing social and emotional learning. ​We hope to have a weekly mindfulness workshop after Christmas. Next Friday 16th December, our Christmas Concert will be held at Bluebell Community Centre at 1p.m. 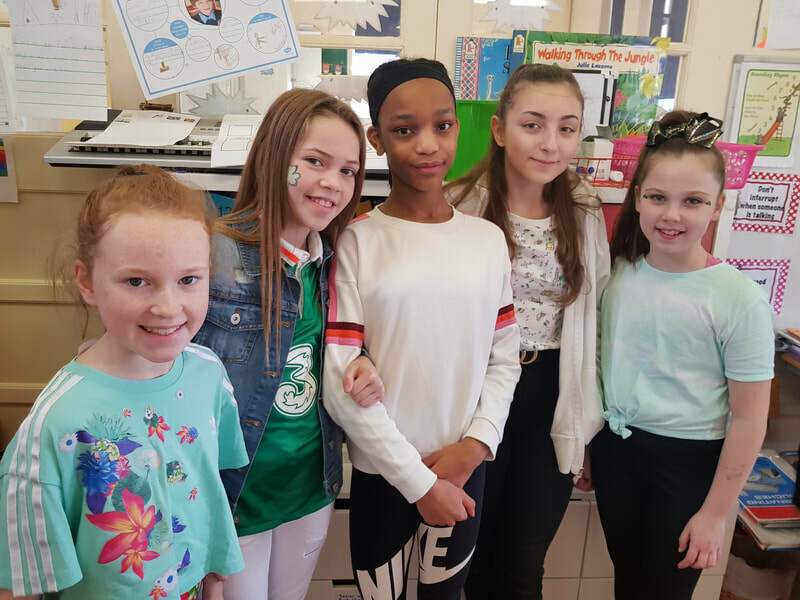 All the children of St. Cillian's have been working hard in rehearsals and we hope that everyone will enjoy our performances. 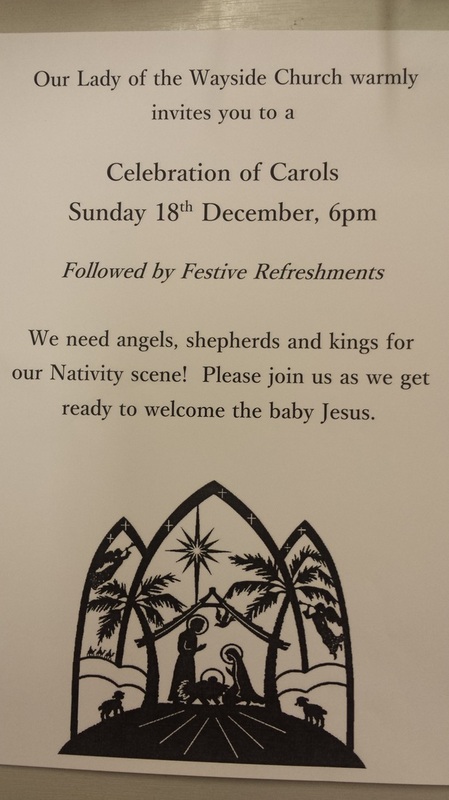 The Parents Association Christmas Party and Raffle will be held directly after our concert at approximately 2p.m. We are continuing to accept donations for hampers. Please drop items into the office. 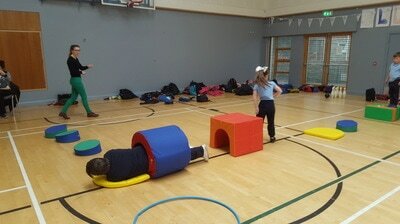 Recently the staff of St. Cillian's participated in a First Aid Workshop with Michael from STAC Training in Limerick. 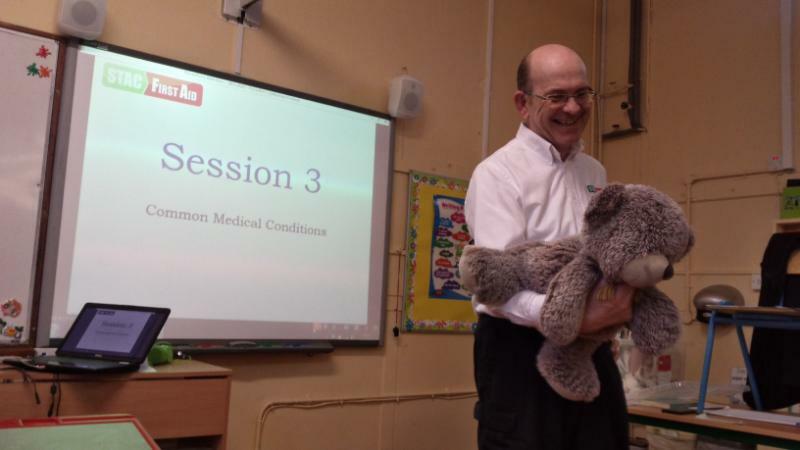 We had a surprise volunteer when Fred our Teddy helped Michael demonstrate how you help a baby when they are choking......He is a bear of many talents! Congratulations to the Senior Room full attendees for October. They were Alex, Caoimhe, Aaron, Talya, Leon, Lee, Stuart and Ryan. Breakfast was freshly cooked sausages, rolls, Frubes and fresh blueberries and raspberries. 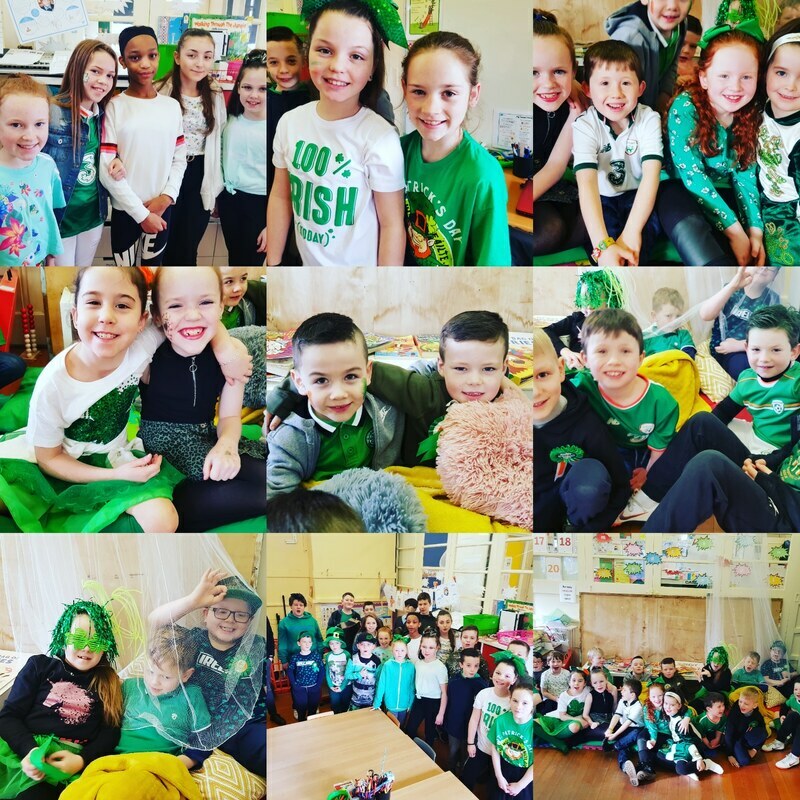 Look How Much We Have Raised! The Parents Association are delighted to report that the amount raised (so far!) 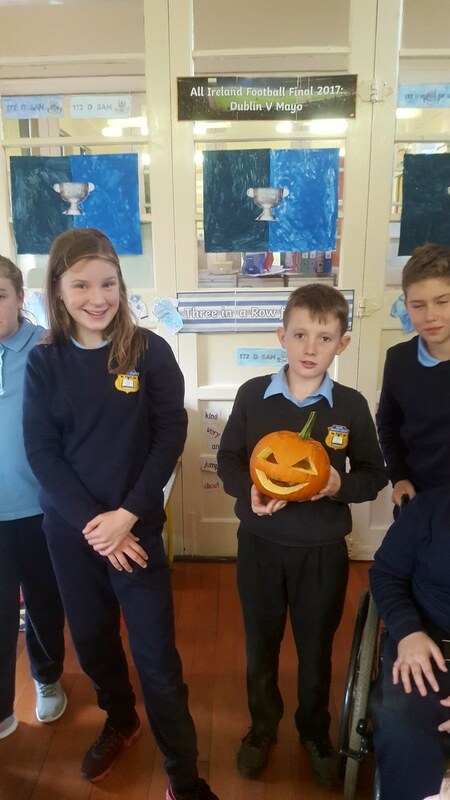 for the Halloween Witches Walk amounts to €1219.65. What an amzing amount for such a small school! 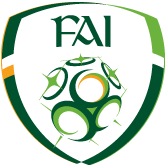 We would encourage anyone with sponsorship cards at home to return them so we can update the figure it we need to. A very big thank you to everyone involved in the event. 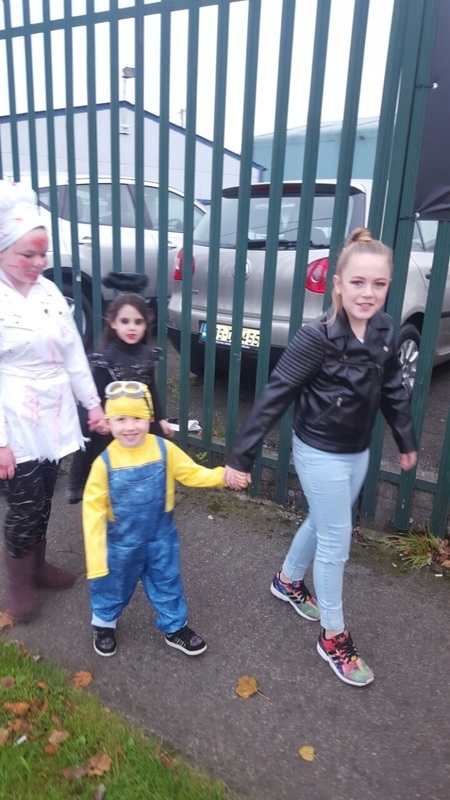 A fantastic effort by all for our annual Halloween Fundraising Walk. 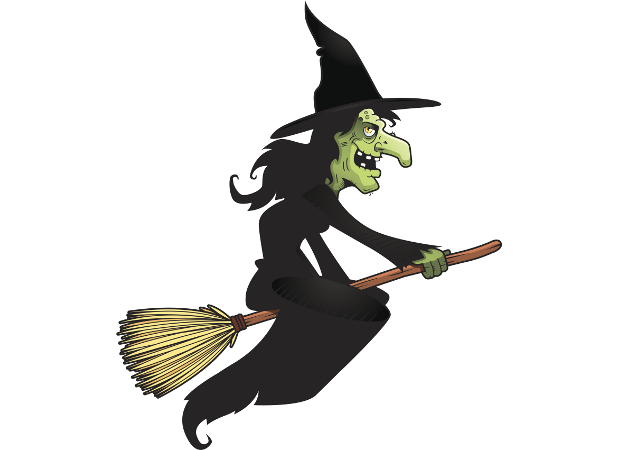 On Friday 28th October, all the witches of St. Cillian's will be parking their broomsticks and taking to the road with their feet to complete a Witches Walk in aid of the St. Cillian's Parents Association 2016/2017 fundraising drive. 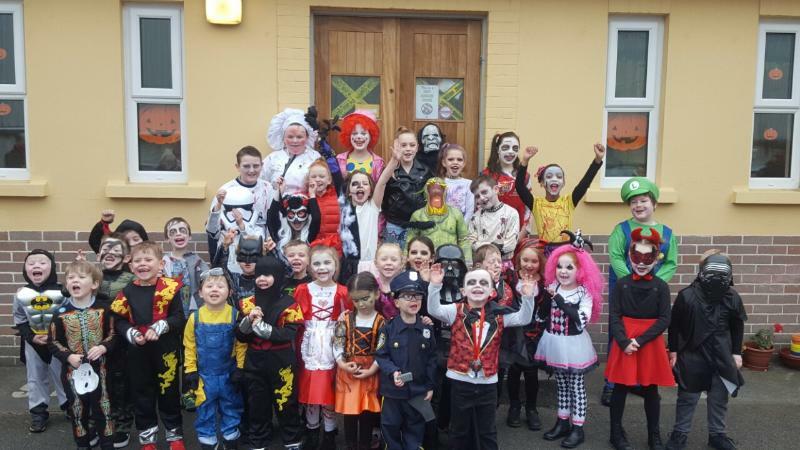 All children (parents & grandparents) are encouraged to dress up in their scariest Halloween costumes and participate in the event. Children are asked to bring €2 for dressing up and sponsorship cards for the walk are available from the school office. Further details to follow during the week. 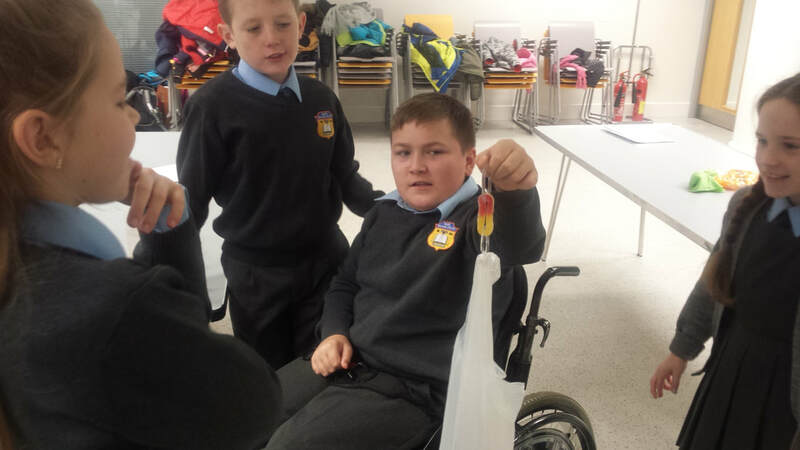 On Friday, all parents were invited to attend Maths 4 Fun sessions organised by Mr. O'Donovan and Mr. Gubbins. We had a selection of new maths games for the children to play, with a focus on number & place value, sorting and patterns, operations like addition, subtraction, multiplication and division. 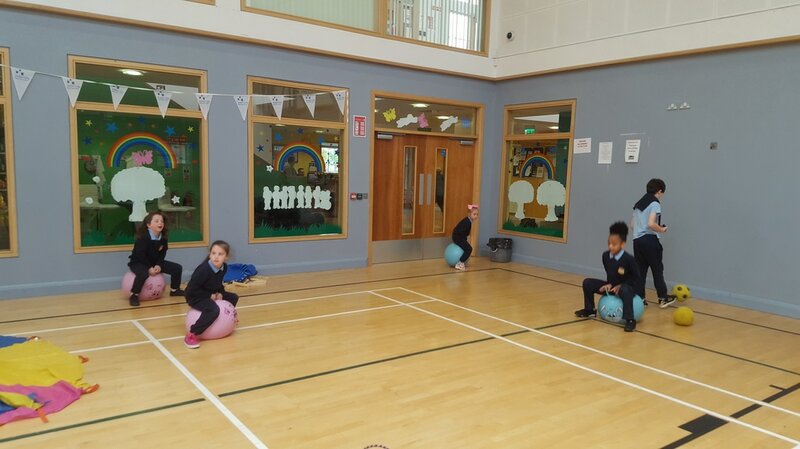 The children rotated through the stations every 15 minutes and we had wonderful help from the parents who manned each station. Our visiting parents also encouraged and supported the children through the games which made the event a fantastic success. 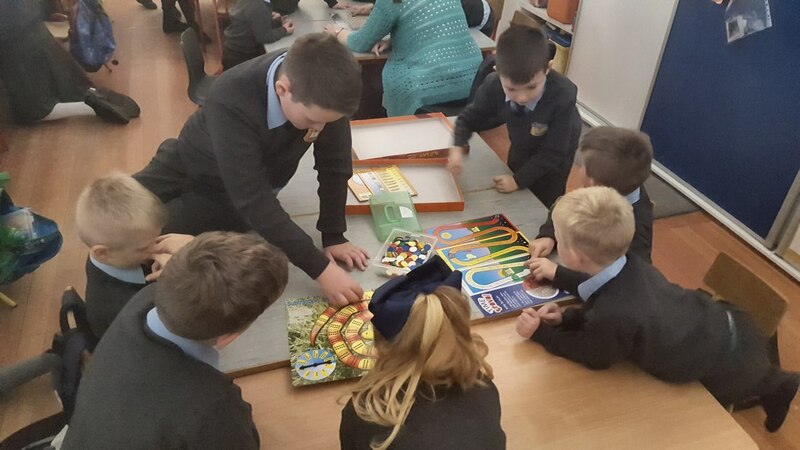 We hope to run these events more frequently throughout the year, not just for Maths Week. 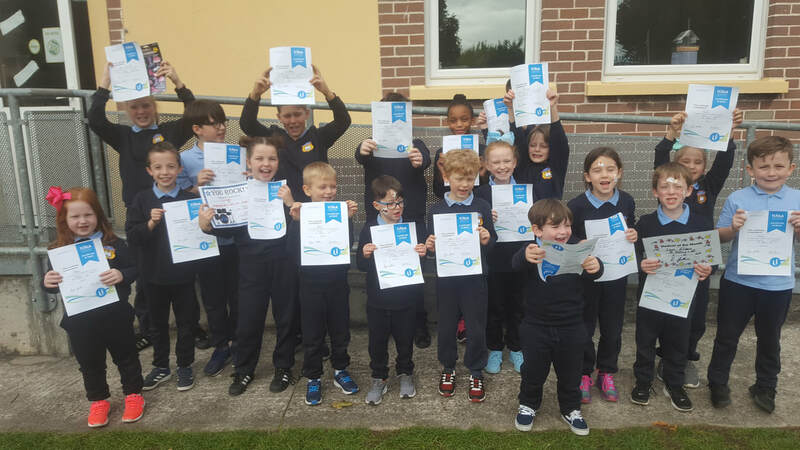 It’s that time of the year again when we turn our focus to the whole area of Maths and the marking of the 11th Annual Maths Week in Ireland from Oct 15th to the 23rd. 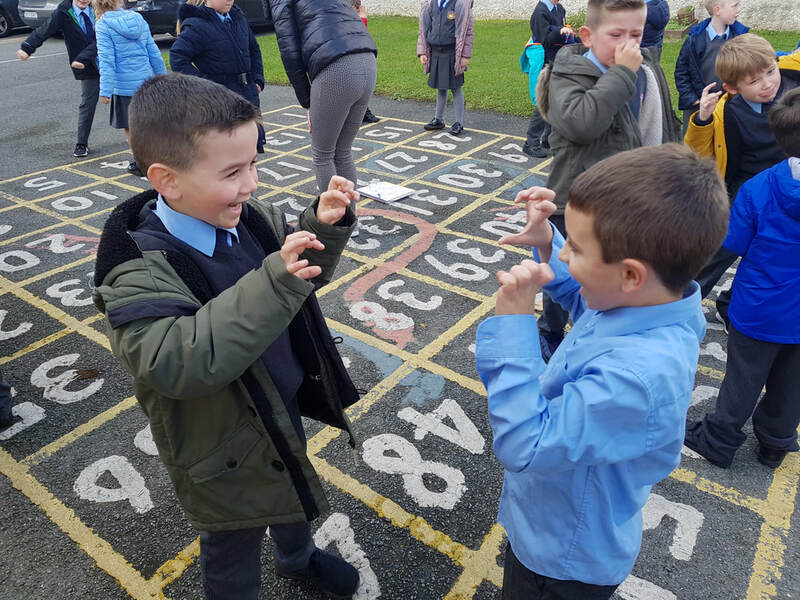 As with previous years in St.Cillian's N.S., we too will be sharing in the fun surrounding the whole area of Maths from Monday 17th to Friday 21st of October. 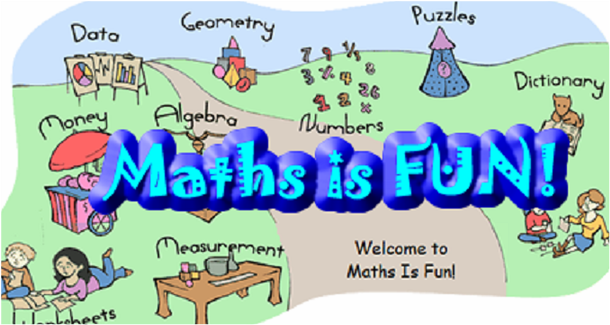 Yet again we are hoping that some of parents will volunteer for Maths 4 Fun on Friday next and visit your child’s class to present a fun filled maths related workshop lasting approximately 1 hour. 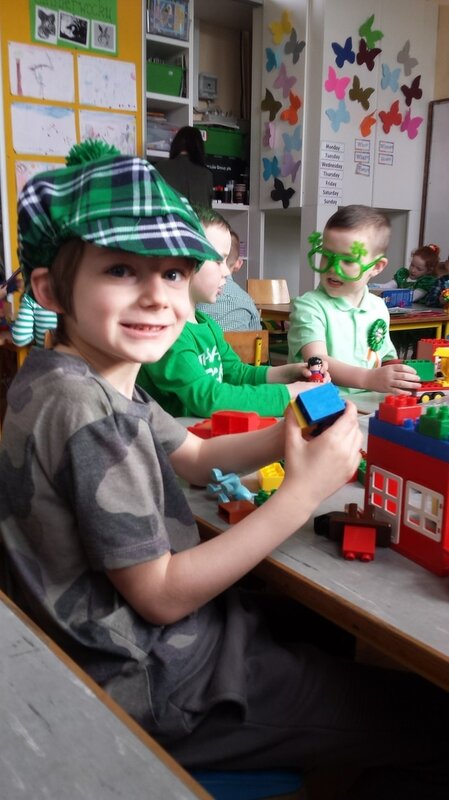 We are hoping to make this year’s participation from parents even bigger than previous years so please don’t feel you need to be ‘the best at maths’ but rather willing to share your love and appreciation of the uses of number in a fun like way. 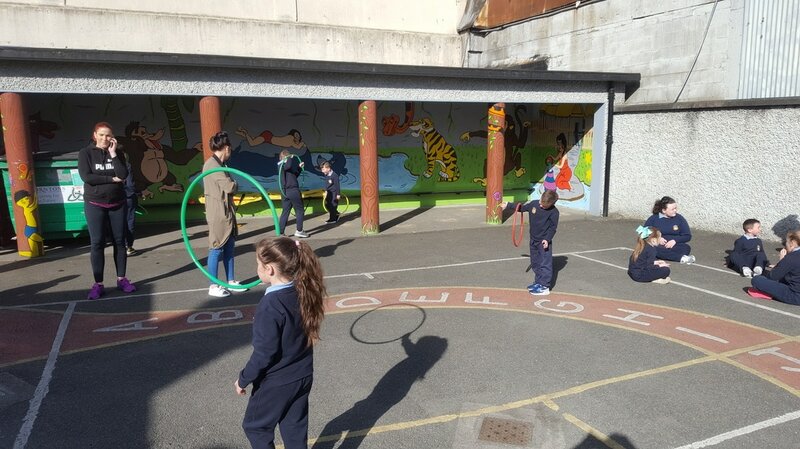 To mark the week here in the school, all classes will engage in age appropriate maths trails around the school and get to enjoy lots of maths related activities in the classrooms and outside in a fun and interactive way. Wow! What a Tuesday Surprise! Thanks to a wonderful community effort in Bluebell, a fundraiser for a St. Cillian's N.S. past pupil, Kevin raised nearly €20,000. 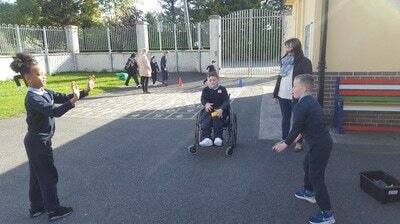 The proceeds were to fund a new sports wheelchair for Kevin who is a keen sportsman, travelling the country and abroad to play Power Soccer. The fundraiser went above and beyond the target and the organising committee kindly decided to donate the funds to a range of good causes including a homeless charity, Prader Willi Syndrome Association Ireland, Our Lady of the Wayside N.S. 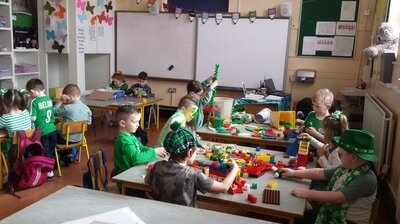 .......and St. Cillian's National School! 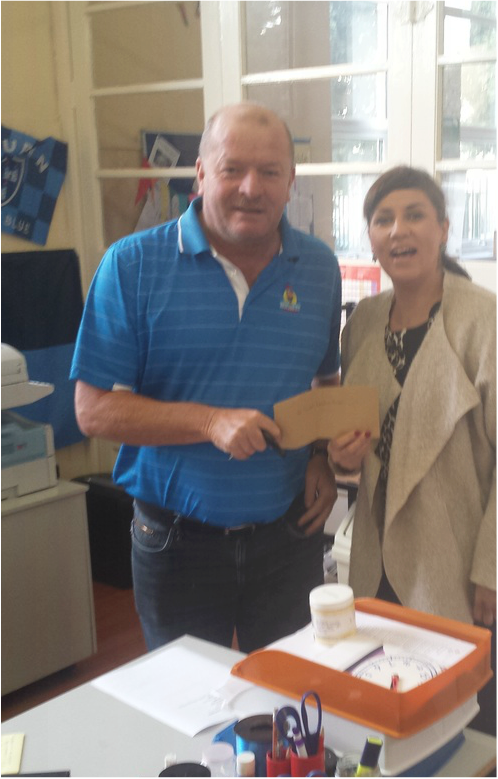 We were absolutely thrilled to receive a cheque for €2,000 from Christy on Tuesday morning. 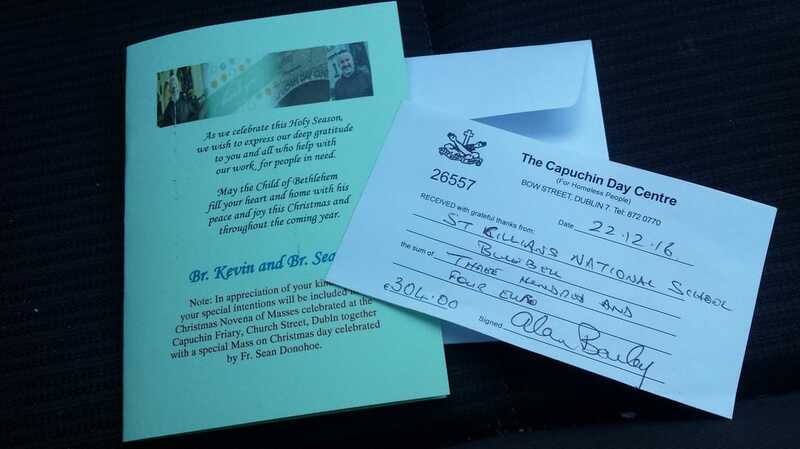 What an amazingly generous gift! The funds will be used to kickstart our Senior Room refurbishment, purchase readers and Maths equipment for all the St. Cillian's children to enjoy. Thanks again for such a fantastic gesture of community support. 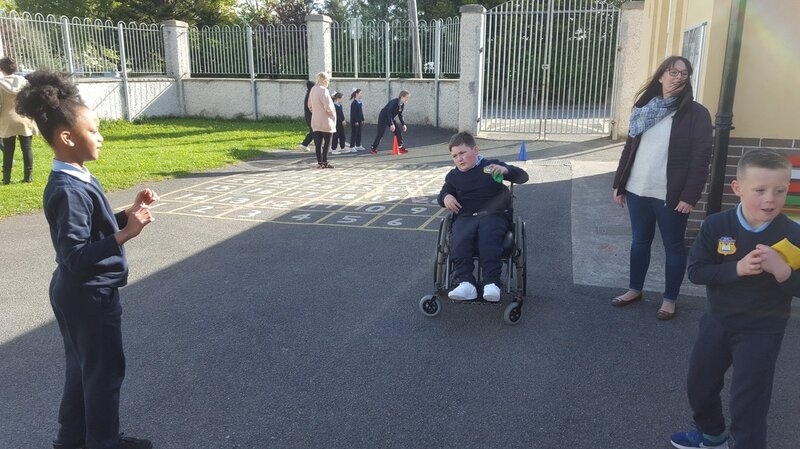 After a substantial campaign throughout the last school year, we have finally seen an upgrade to the wheelchair accessible parking space outside our school. 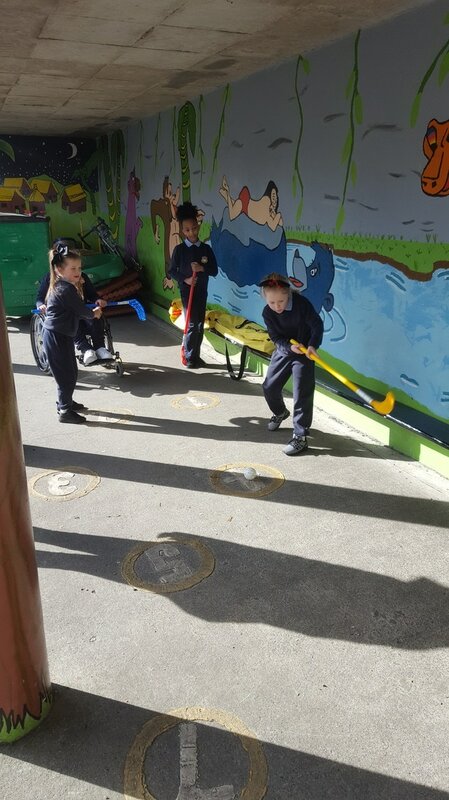 The lining of a walkway is a step in the right direction by South Dublin County Council, however it is not ideal as the walkway takes children along the front of busy garage workshops and sales areas. 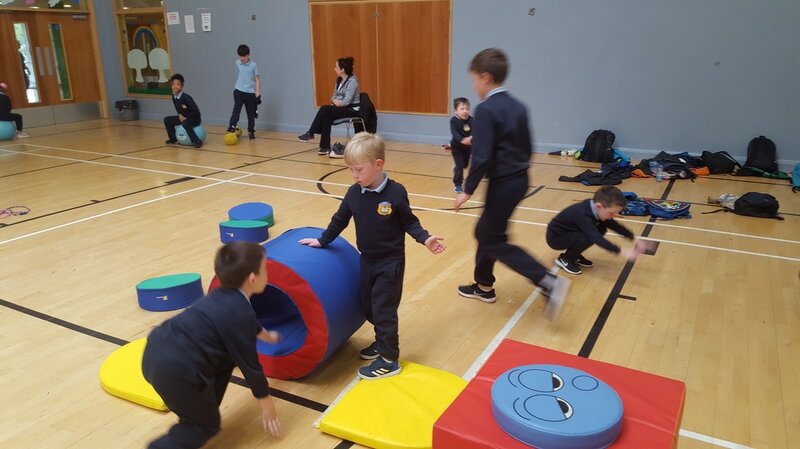 Already this school year, Ms. O'Farrell has contacted all our local representatives, South Dublin County Council's Safety Officer and Executive Officer along with the Gardaí to express her concern at the continuing situation. 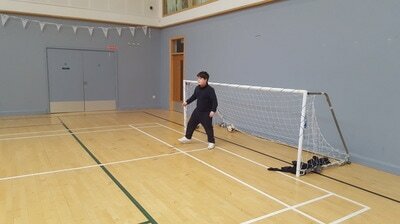 The need for a school setdown area is one that remains on the school's priority list for the upcoming year. We would ask that parents be vigilant on Robinhood Road as cars are being ticketed and fines issued. We would ask that you remain calm and co-operative at all times with parking enforcement as this will only go to strengthen our case when communicating with the Council and the Gardaí. 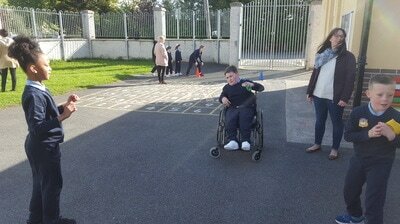 Also, McDonald's car park is available to parents who wish to walk the last part of the journey to school, should they have time. We appreciate your ongoing support. Congratulations to our September full attendees in the Senior Room. We had 10 children tucking into freshly cooked sausages, soft white rolls, frubes, yoghurt drinks and fruit. There was great excitement for the first breakfast of the year. We hope be see all the children celebrating next month's reward. 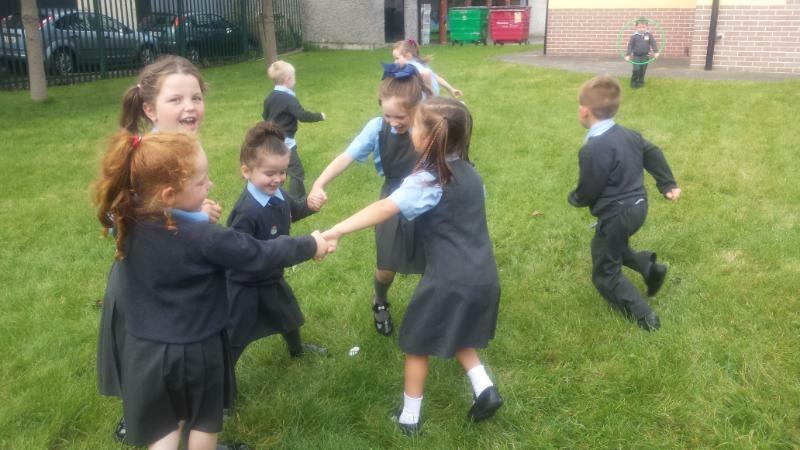 The children of St. Cillian's are enjoying playing in our field in this warm September/October weather. Long may it continue!